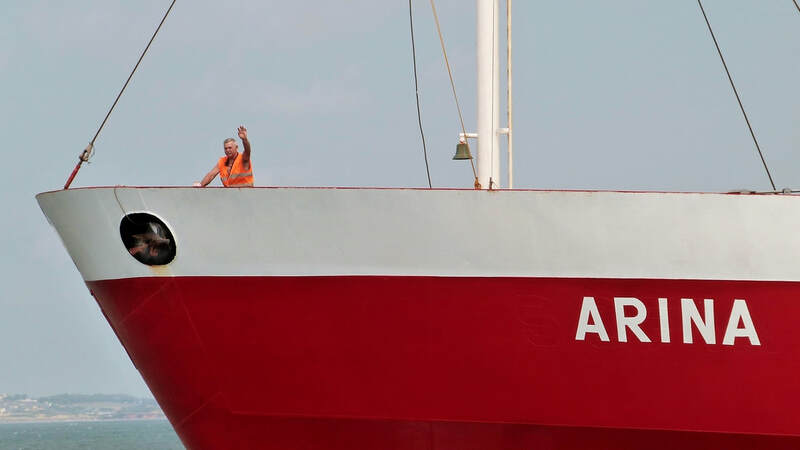 ​A selection of arrival & departure shots arranged in reverse chronological order. Outbound for Dunkirk on a blustery afternoon. ​This had been her second visit with powdered cement from Lisbon. 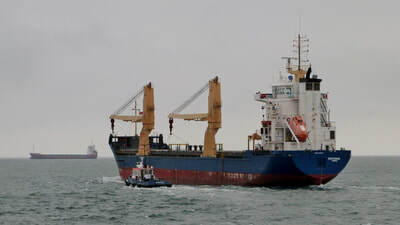 ​​The vessel was eventually on her way after spending six days at the port. ​She had spent most of that time berthed at the timber quay behind CEG COSMOS, see photo to the right. 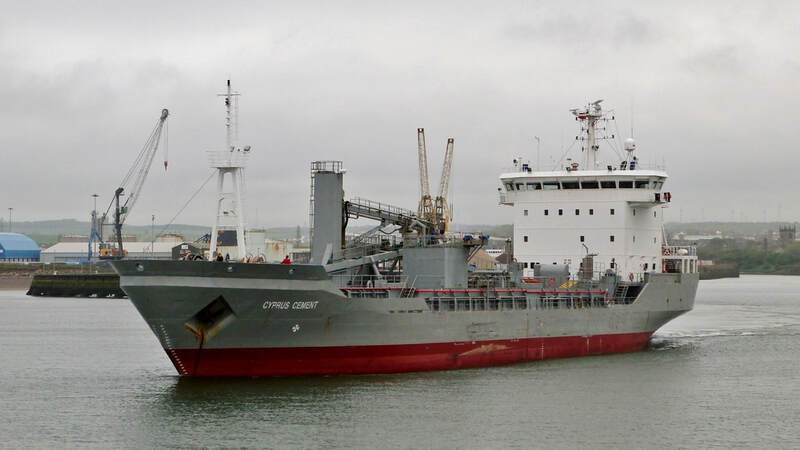 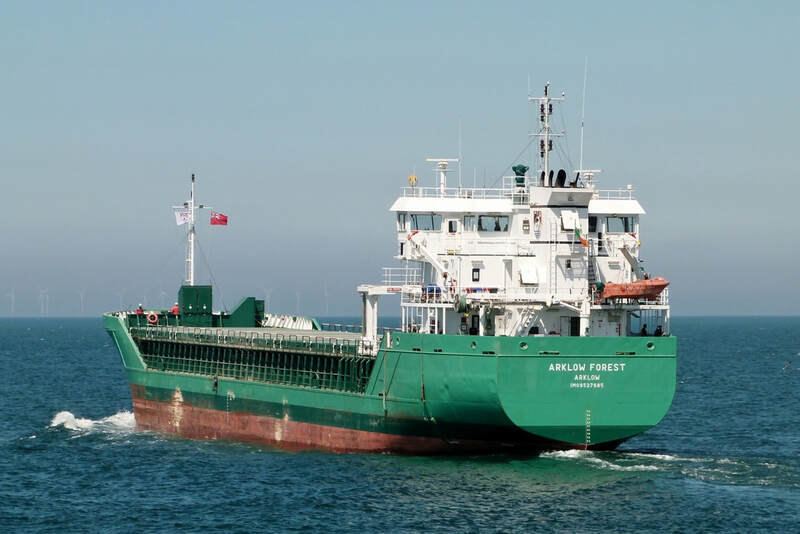 Built in 2008 as the general cargo vessel FLINTERFORTUNE she was converted to a 4,500ton DWT cement carrier in 2014. 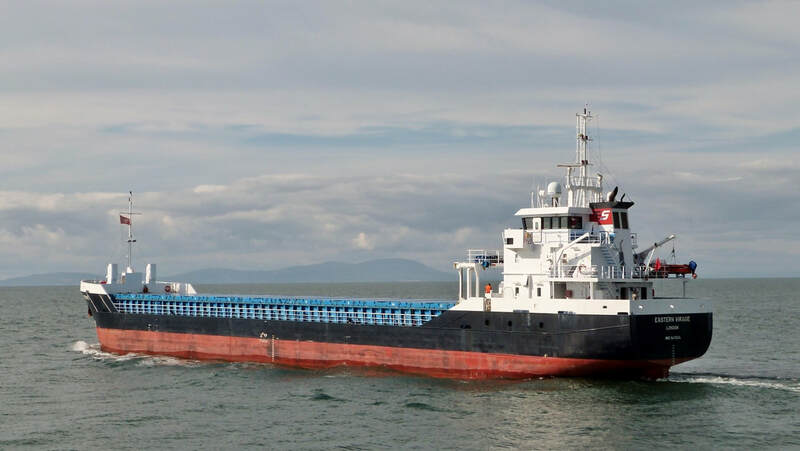 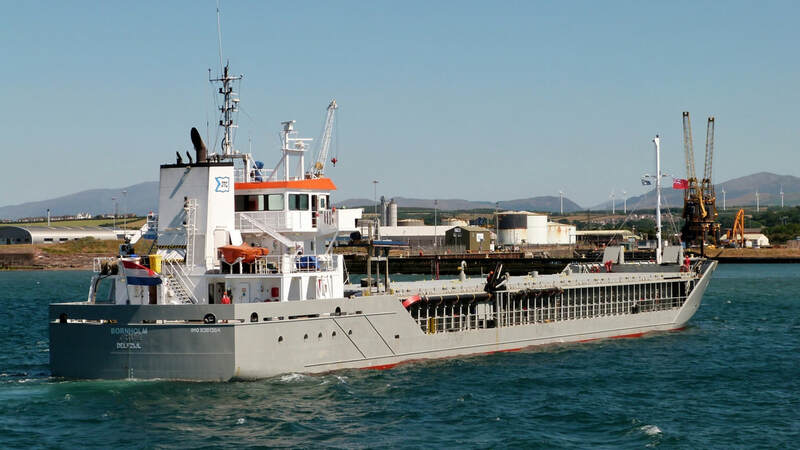 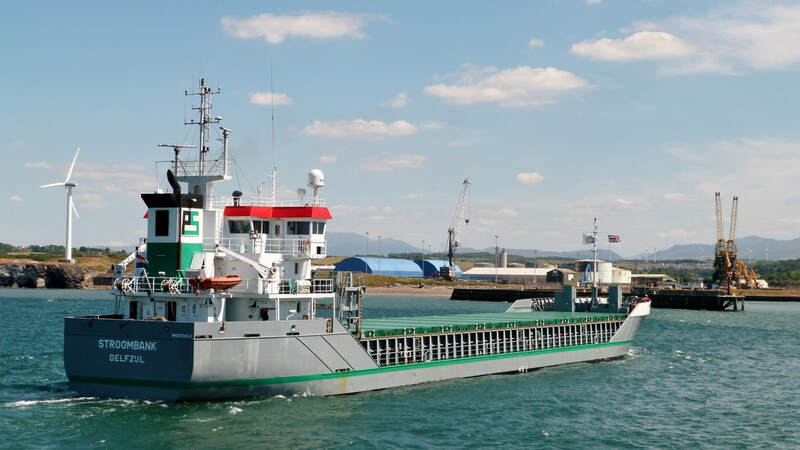 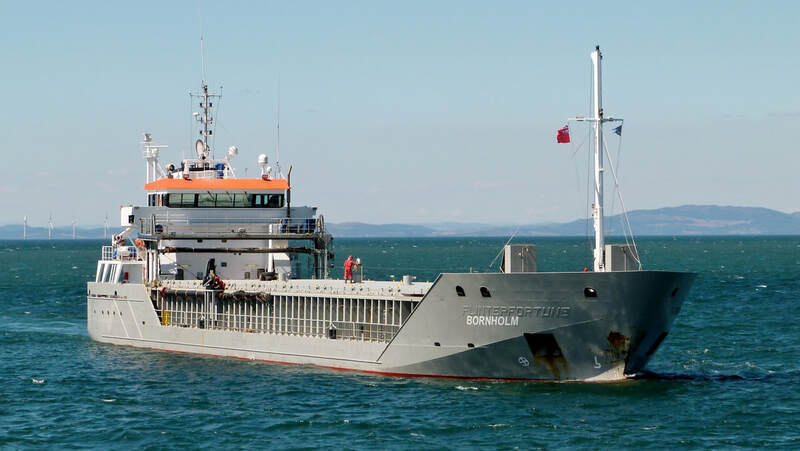 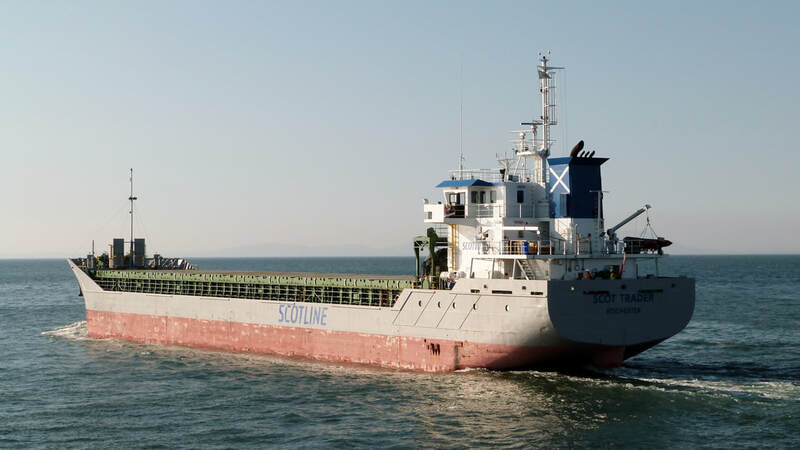 She is owned by 'KGJ Cement', a major operator of pneumatically equipped discharge vessels. 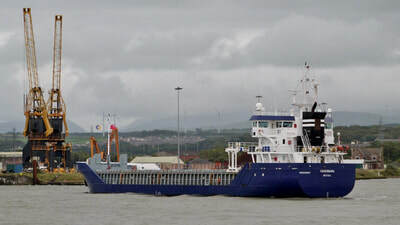 ​NAVIGATOR is one of the recent 'Scotline' new-builds. She has made eleven visits since her launch in June 2017. 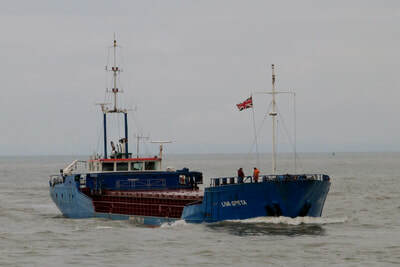 Rain showers held off until she had passed the south pier. 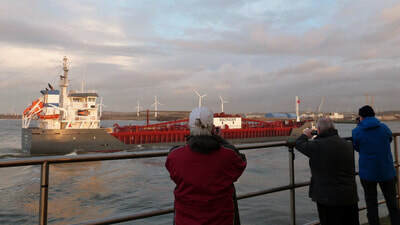 Passing the south pier on a blustery morning. 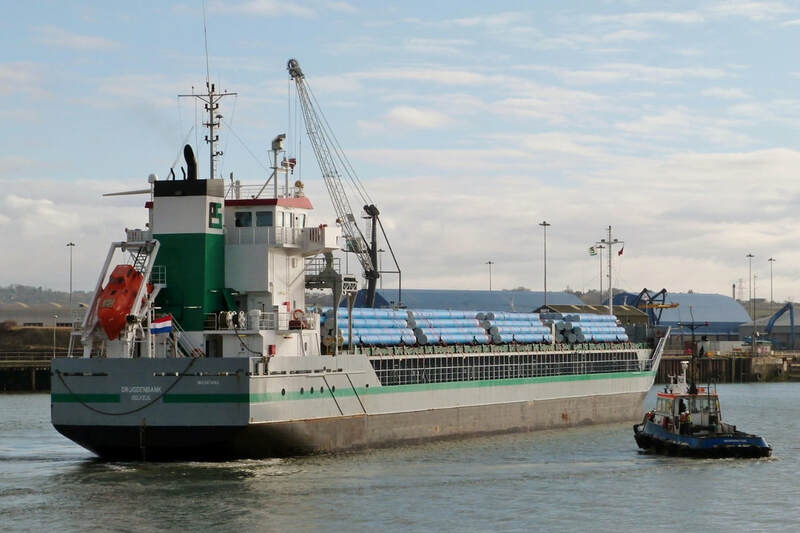 Inbound from Aveiro, Portugal with baled wood pulp for the local paperboard mill. Aveiro is a regular source of this raw material along with Vlissingen. 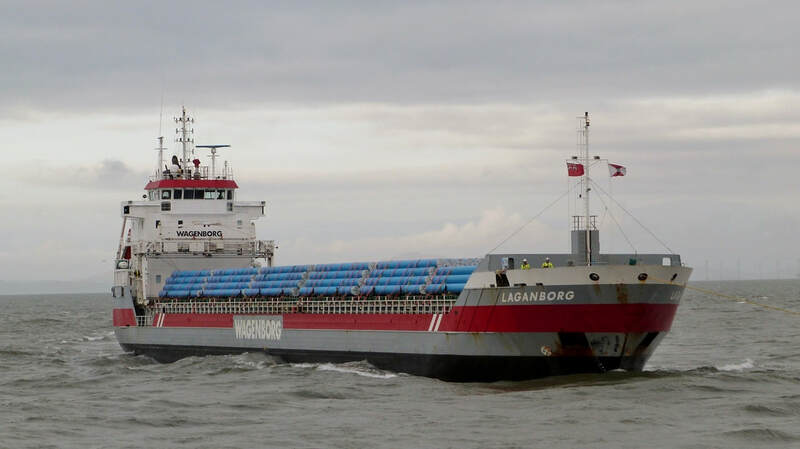 The 4,500ton DWT vessel is owned by 'ESTE' and managed by 'Wagenborg'. 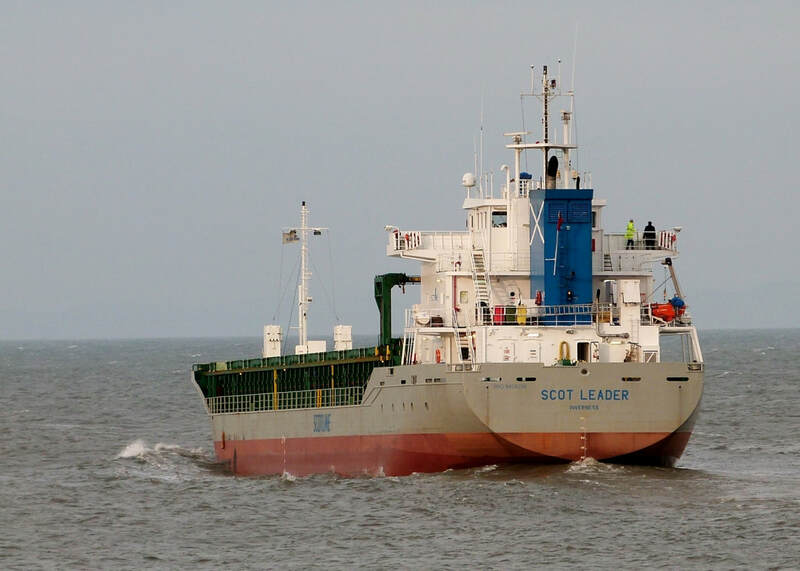 On her approach she passed SCOT NAVIGATOR waiting to dock on the same tide. 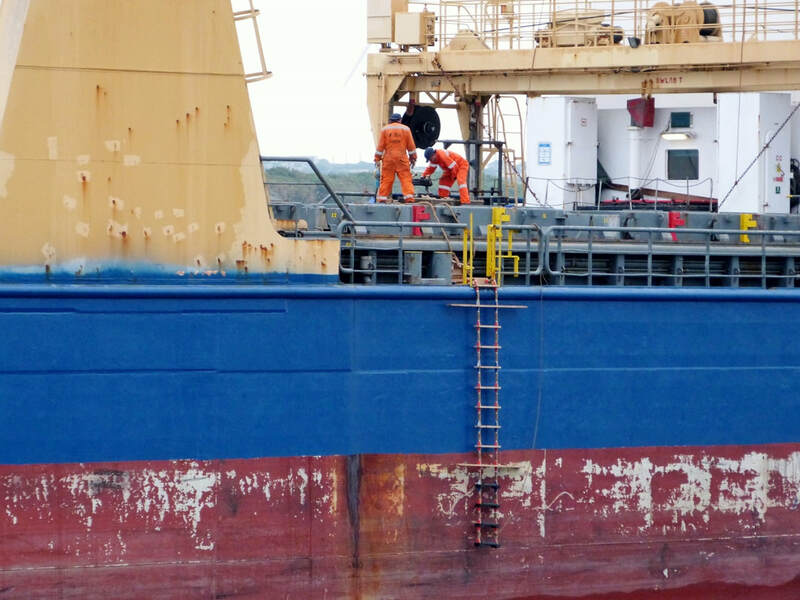 ​Crew were busy preparing the hold hatch covers for unloading as she passed. Inbound from Corpach with a full hold of round timber. 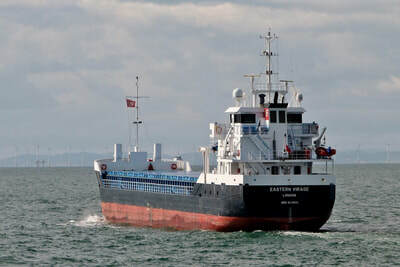 Seen as she passed the south pier into the harbour basin and then entering the dock bow first. 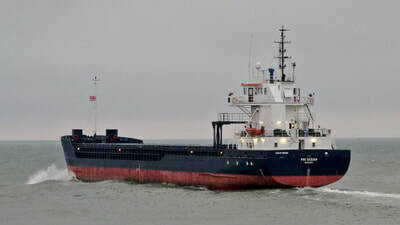 The ship which was built in 1988 is the only one operated by the 'Liepaja Trading & Shipping Agency' whose main business is crew manning. 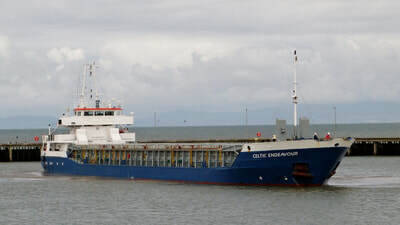 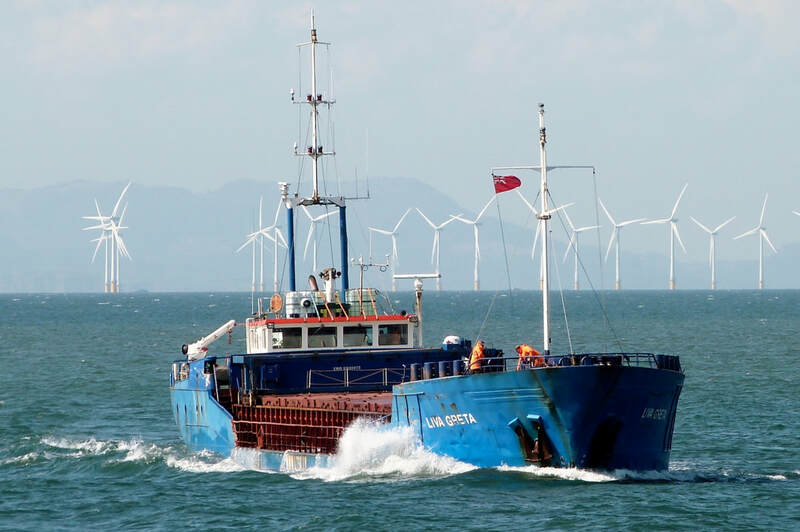 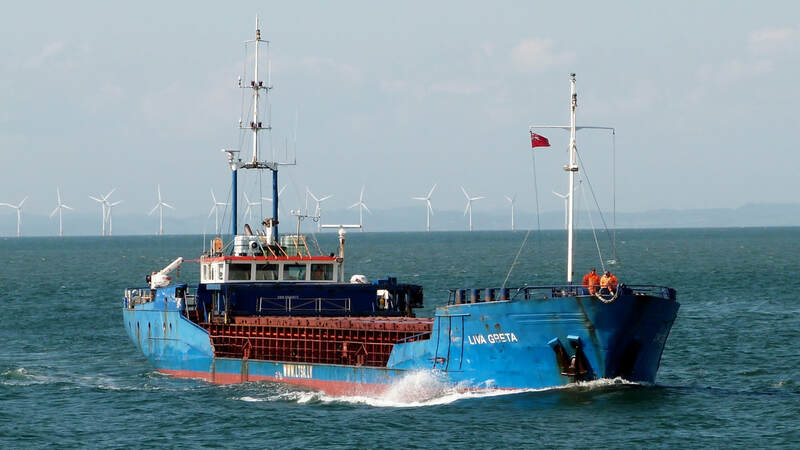 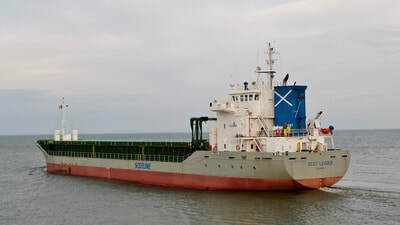 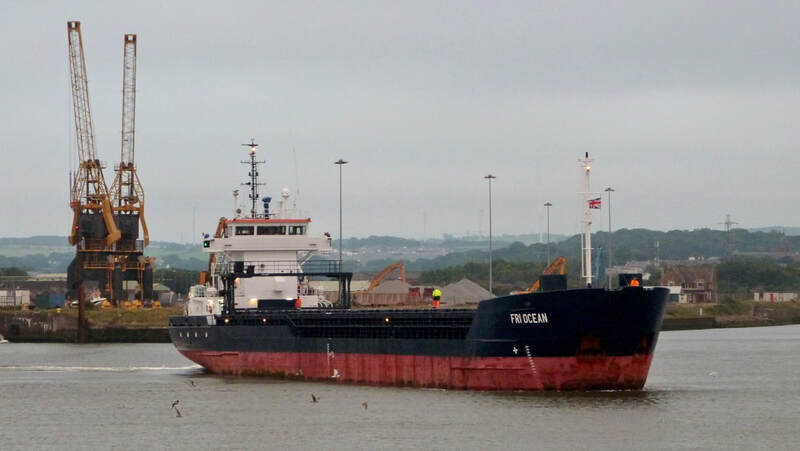 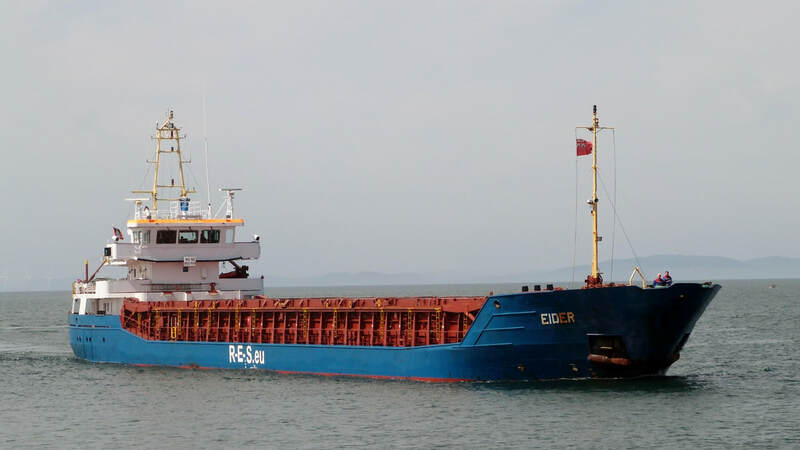 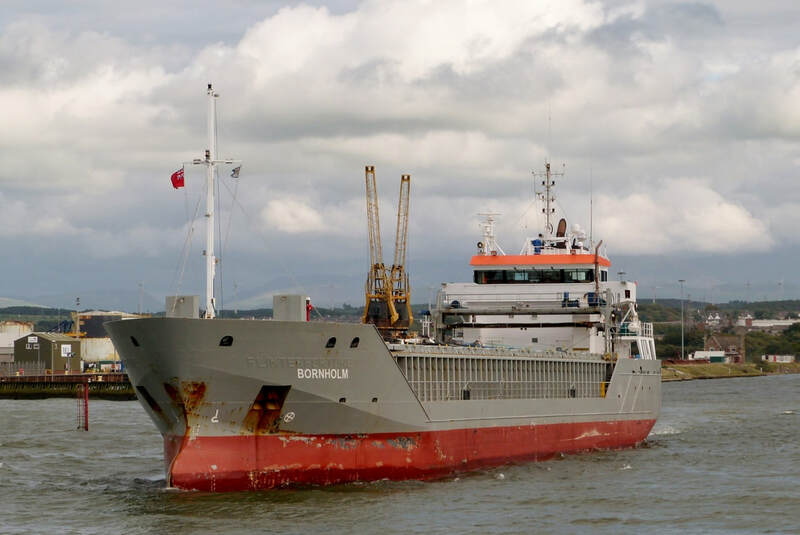 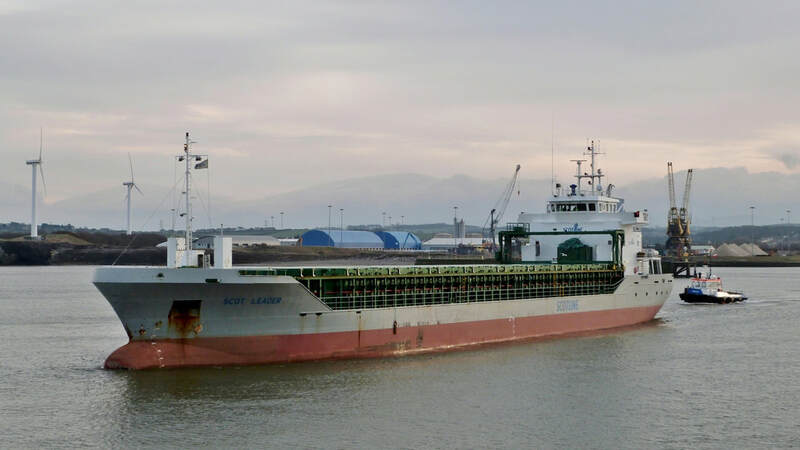 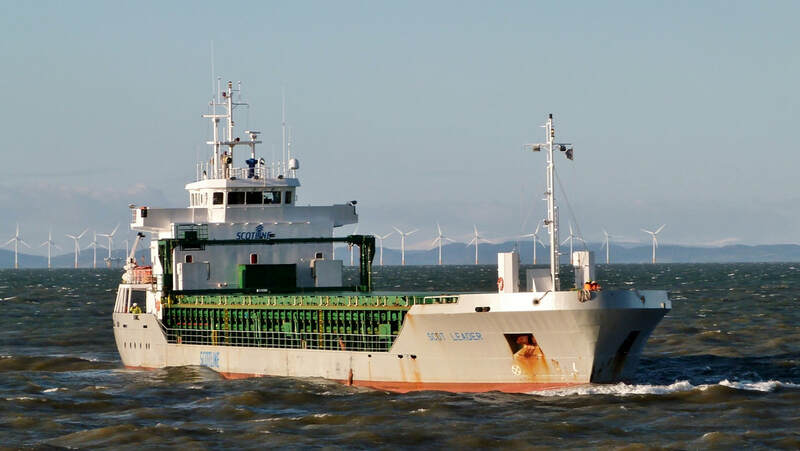 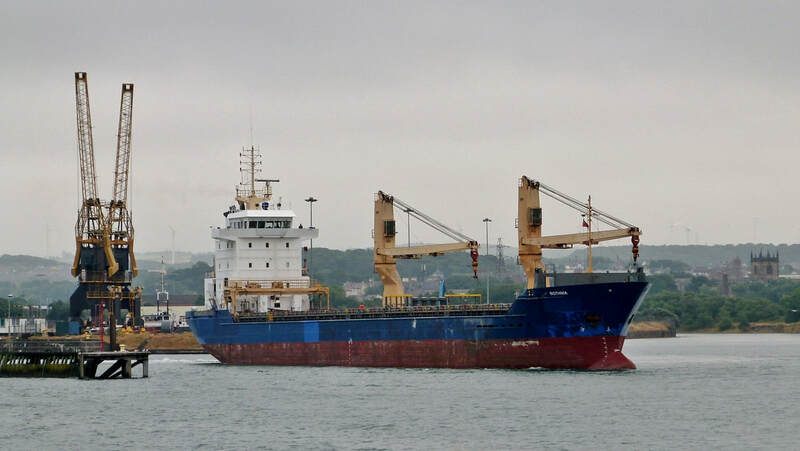 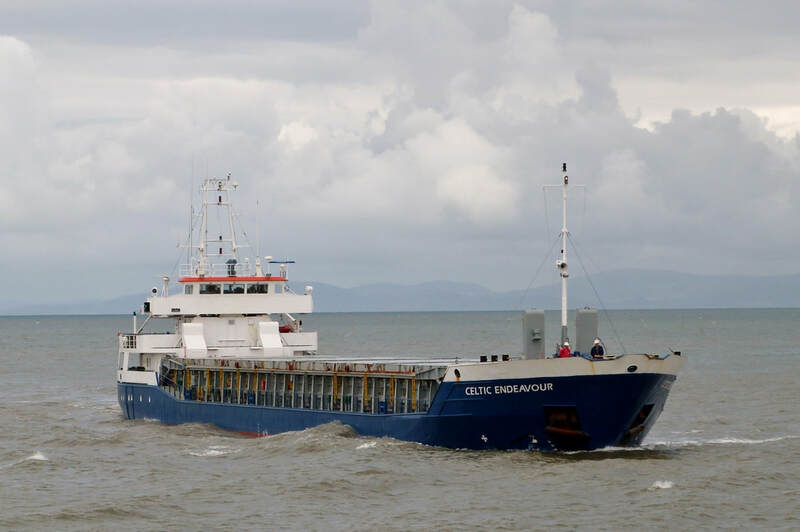 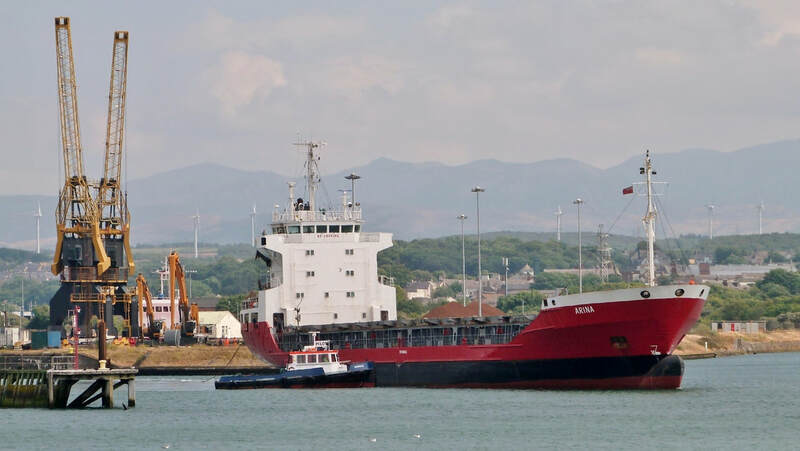 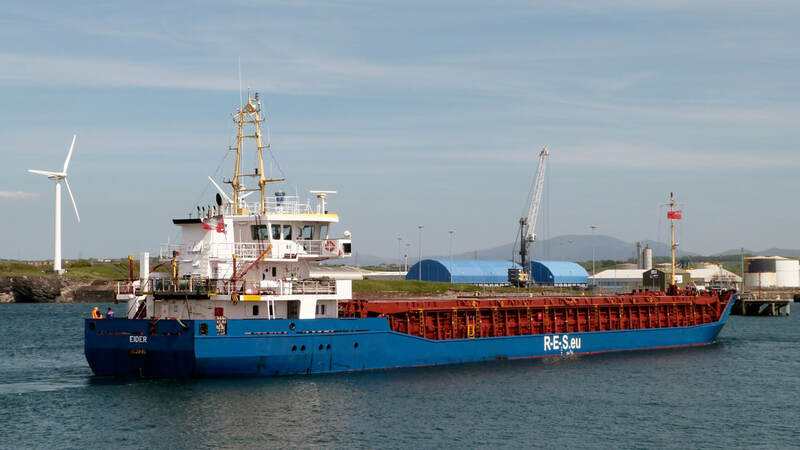 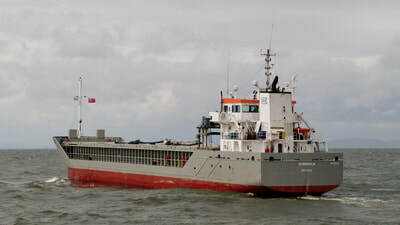 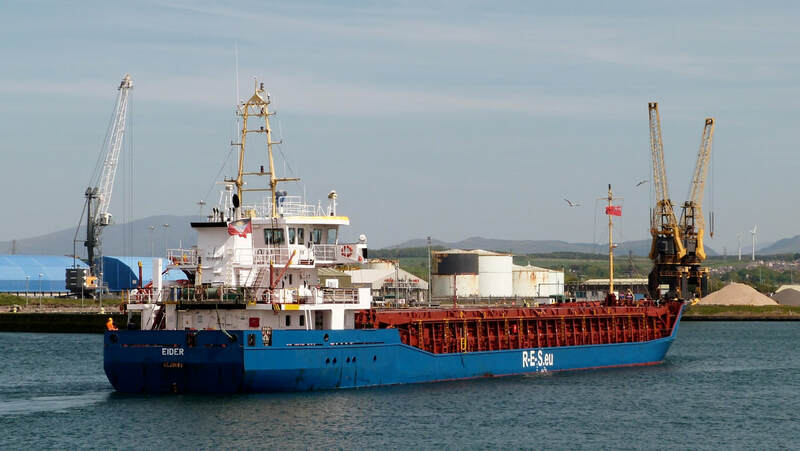 The 64m 1280ton DWT Latvian registered general cargo vessel is a regular on the West of Scotland timber run. 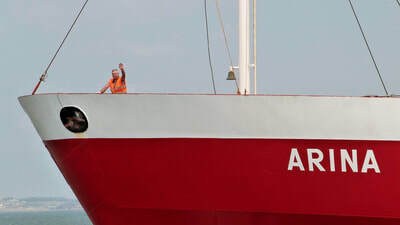 ​The cheery crewman at the bow always gives a wave when he visits. 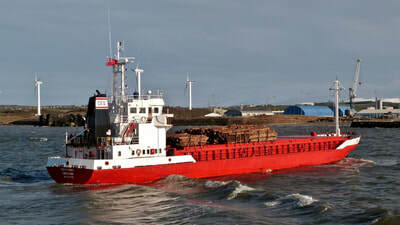 Inbound from Scrabster with round timber on the morning tide. 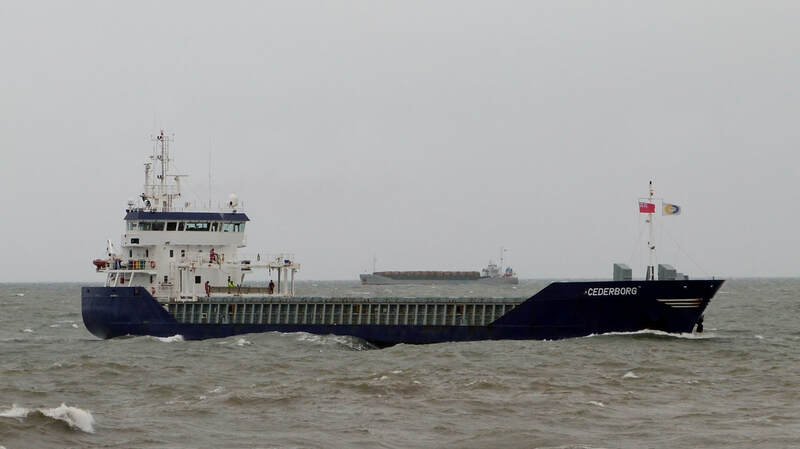 Luckily a break in the showers allowed for a few shots. 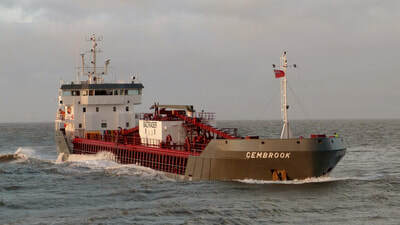 The 3,200ton DWT 89m vessel was built as the Dutch registered VIRAGE in 2012. 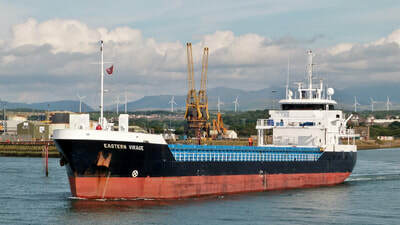 Now London registered & bearing the 'Eastern Shipping' logo she is on time charter to 'Scotline'. 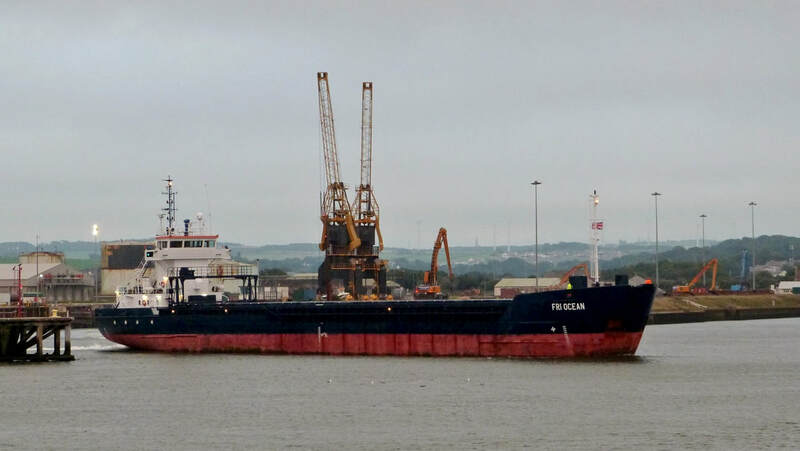 A new visitor with powdered cement from Lisbon. 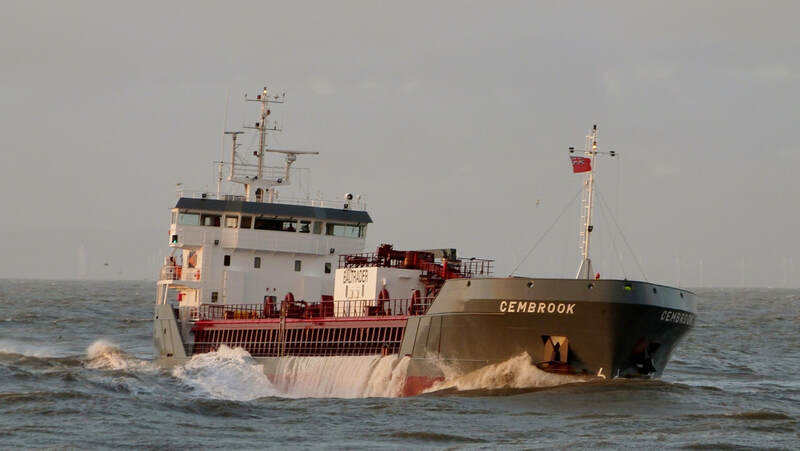 As is often the case, timing wasn't good for photography as she made her entrance with the sun setting on a cloudy evening. 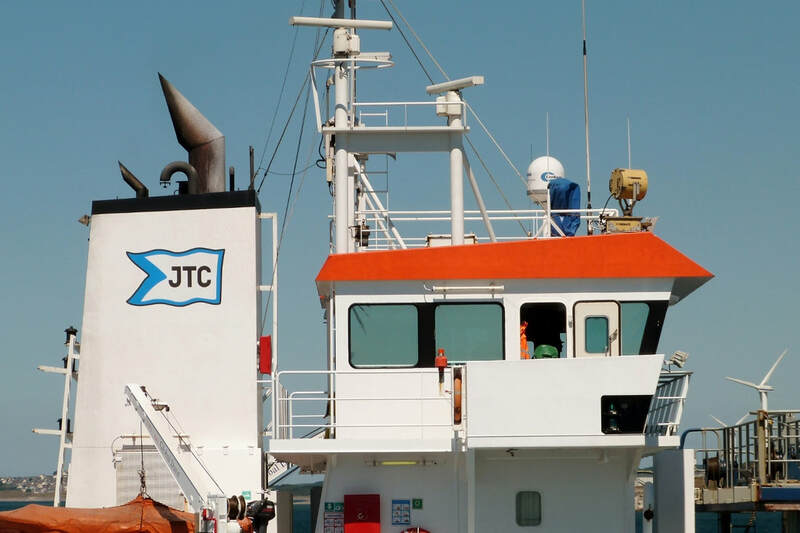 The 4,500ton DWT pneumatic self-discharge vessel bears the funnel logo of 'JTCement'. 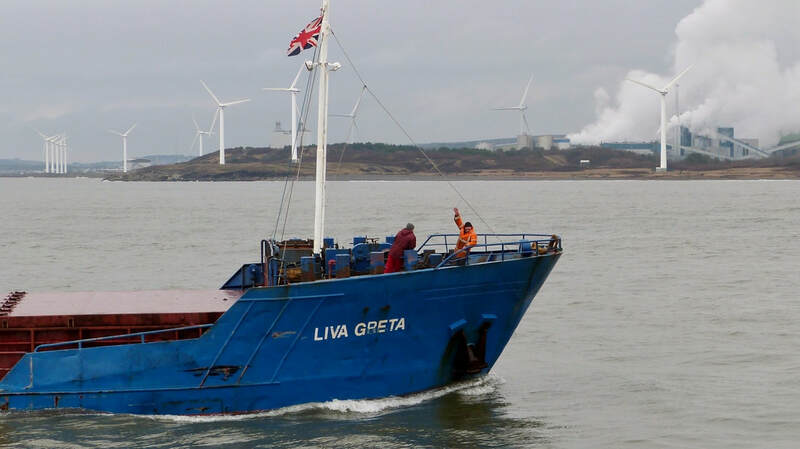 Built in 2006 as VERITAS she was converted from general cargo in 2017. 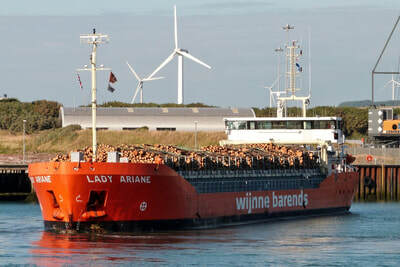 ​Her departure to Denmark two days later was also under the cover of darkness. 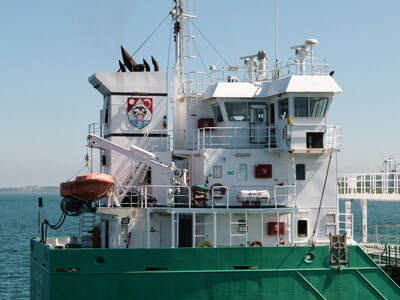 Not even the company website has a recent photo of her. 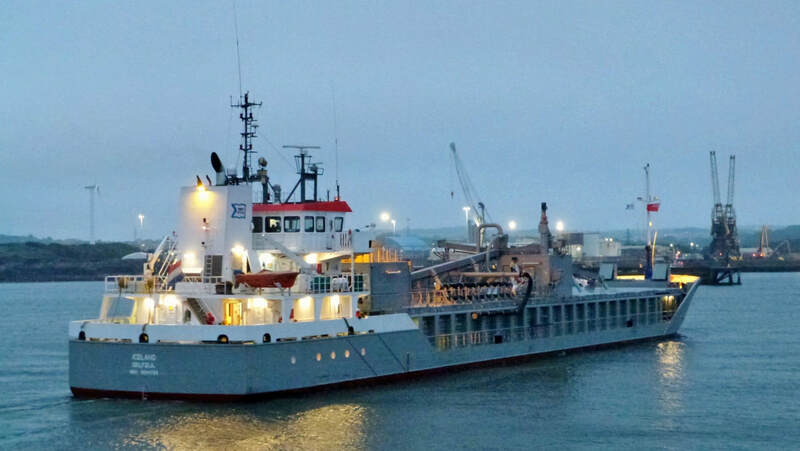 Heading out to Cork as dusk falls. 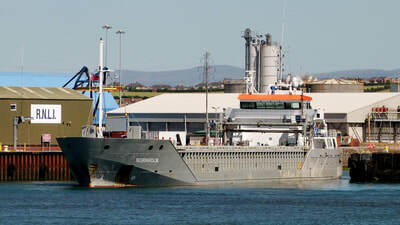 A quick turnaround having arrived on the morning tide from Belfast with aggregate. 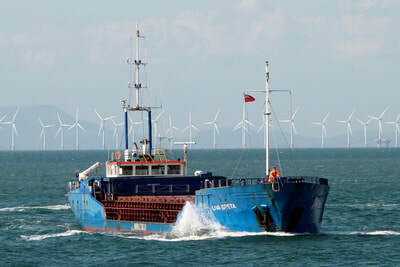 The Nassau registered vessel, built as VERA in 2000, now bears the funnel marking of the Norwegian 'KOPERVIK GROUP'. 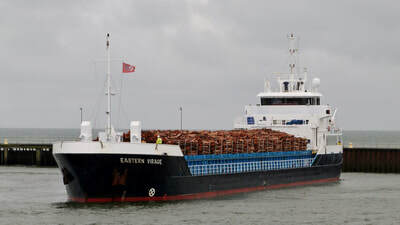 ​The vessel had arrived 24hrs earlier with baled wood pulp from Vlissingen. The ship was on time charter to 'Scotline'. 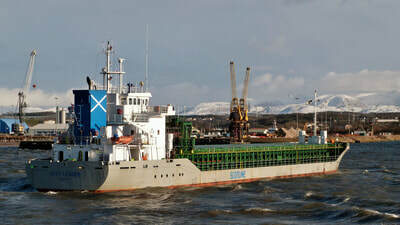 She has since become a regular visitor with timber from West of Scotland. 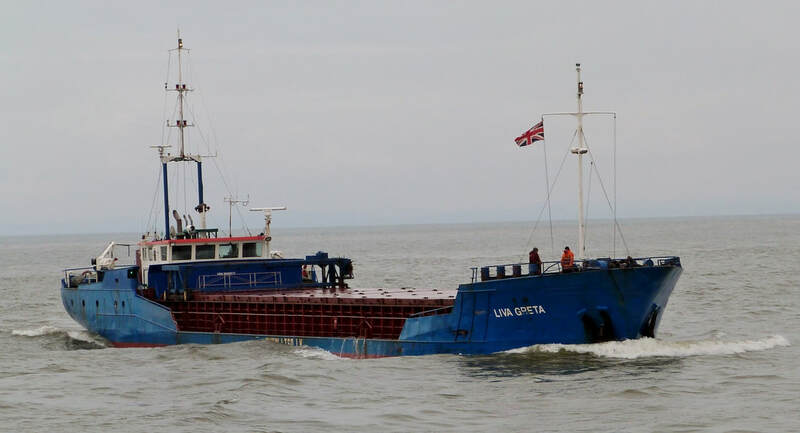 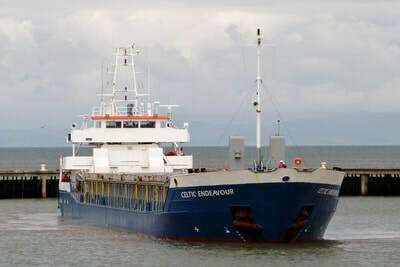 As she entered the Solway she passed ALANA EVITA at anchor after visiting Silloth. 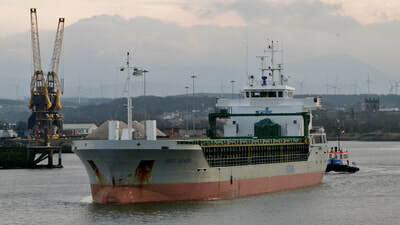 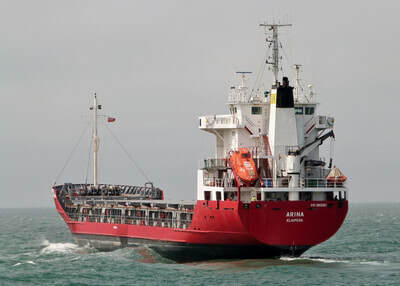 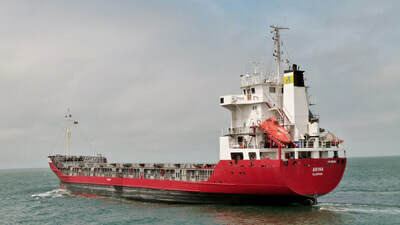 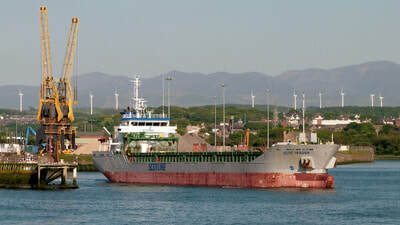 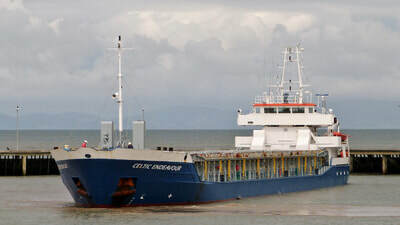 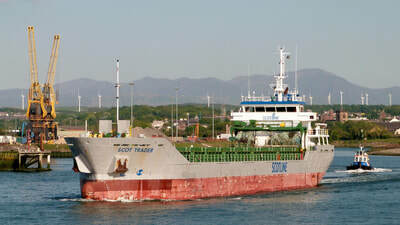 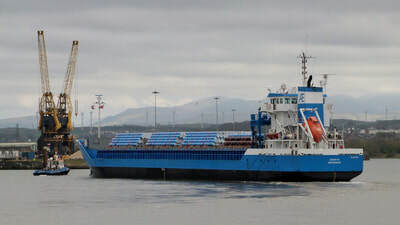 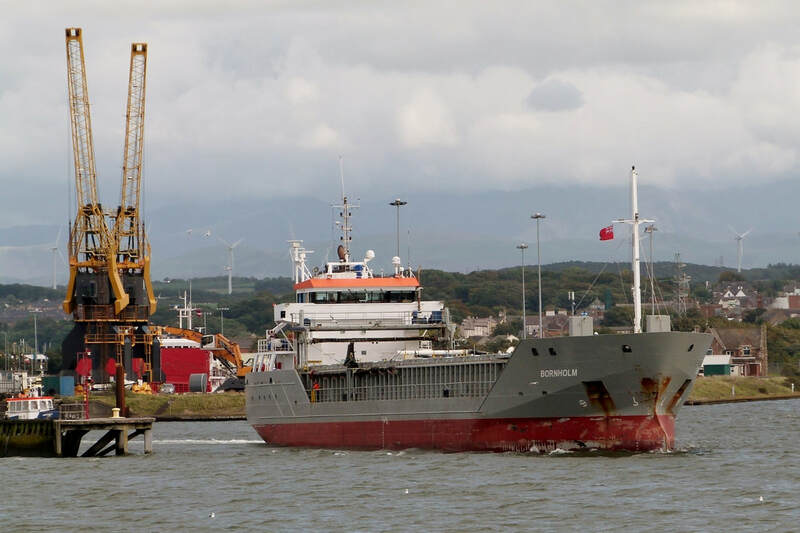 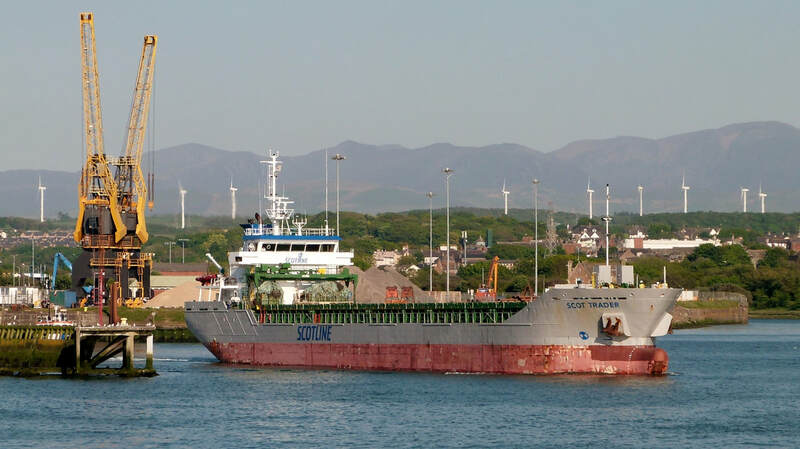 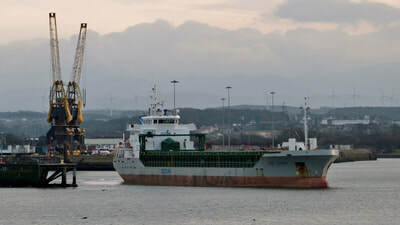 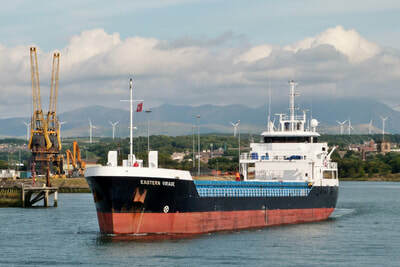 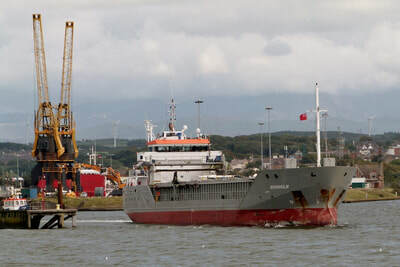 The Cardiff registered vessel inbound from Spain. The 3,700ton DWT vessel, built in 1997 is 1 of 9 belonging to 'Charles Willie Shipping'. 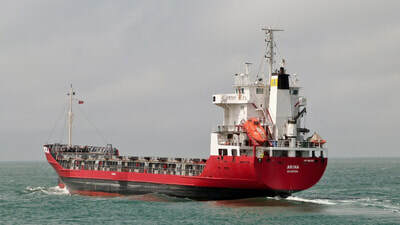 She is seen above turning in the harbour basin on a cloudy afternoon. The gallery shows her approach in the channel before turning in the basin..
​Outbound for Glasgow after delivering powdered cement from Lisbon. 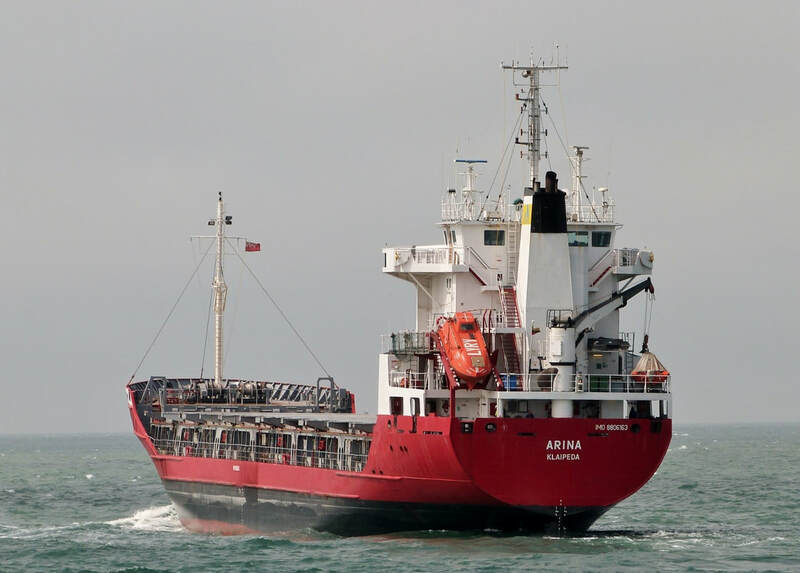 The 5,000ton DWT vessel was added to the 'Arklow' fleet in 2011. 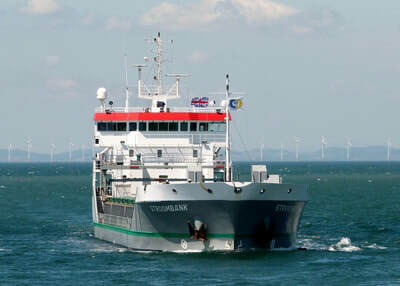 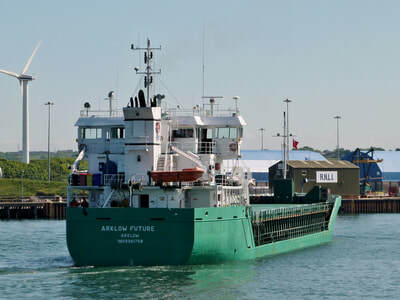 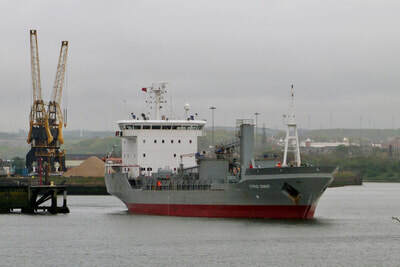 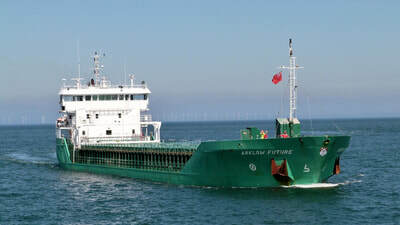 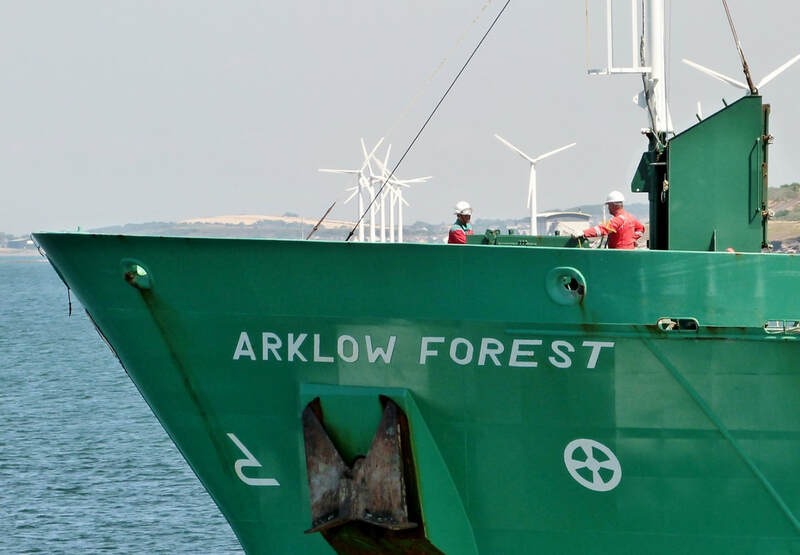 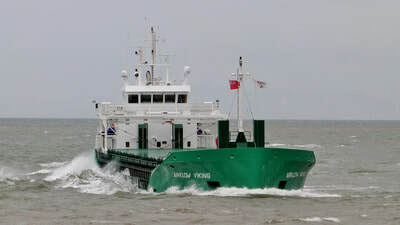 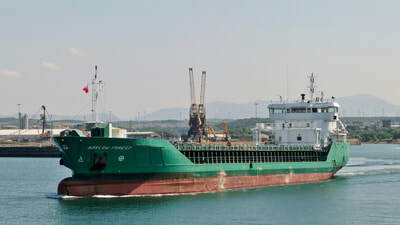 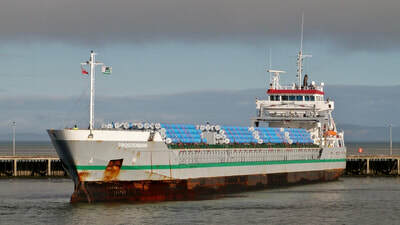 She is 1 of 10 of the ARKLOW 'F' series built between 2006-11. 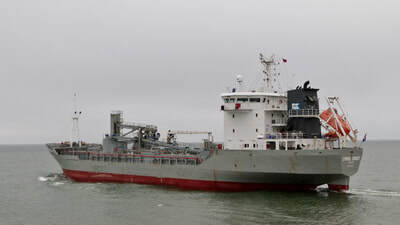 She is not a specialist cement carrier with on-board pneumatic equipment. 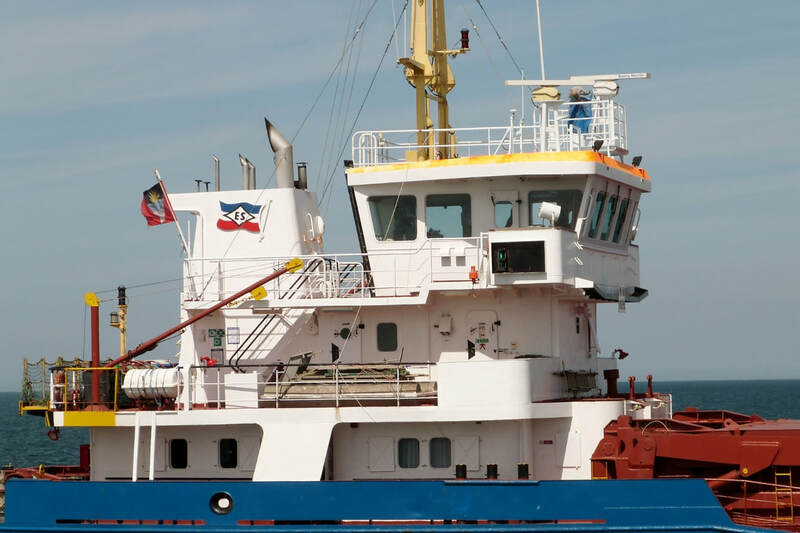 Contractors dockside pumps are used to do the job. 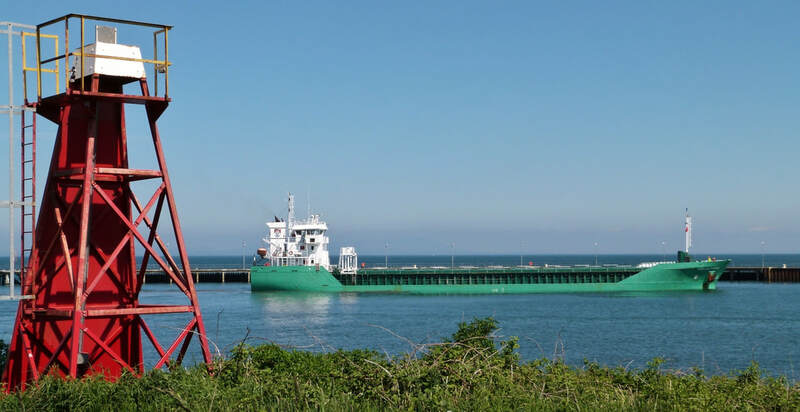 This method is less efficient with it taking up to 3days to unload. 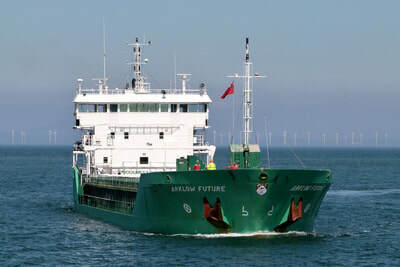 Seen outbound having arrived 24hr earlier with peat moss from Dublin. 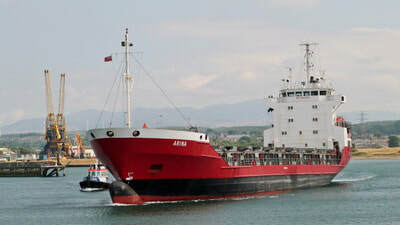 The 4,400ton DWT vessel, built in 1989, is owned by the Lithuanian company 'Afalita Shipping'. 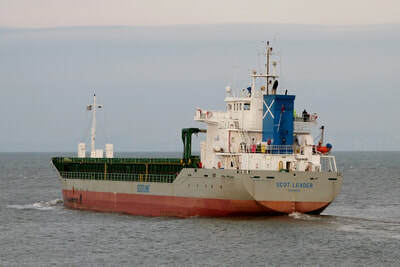 The gallery below shows a smooth departure from the port. The pilot chose to have a stern rope attached to the tug DERWENT to assist exiting the dock. Outbound in ballast on a drizzly afternoon. 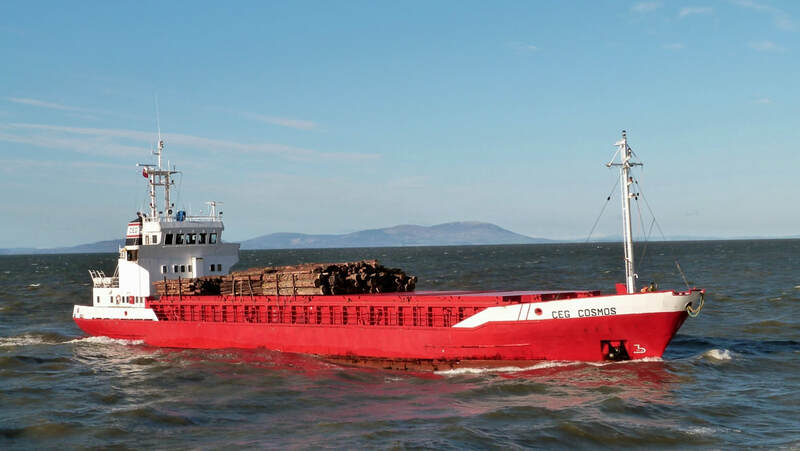 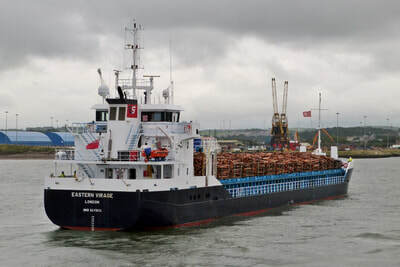 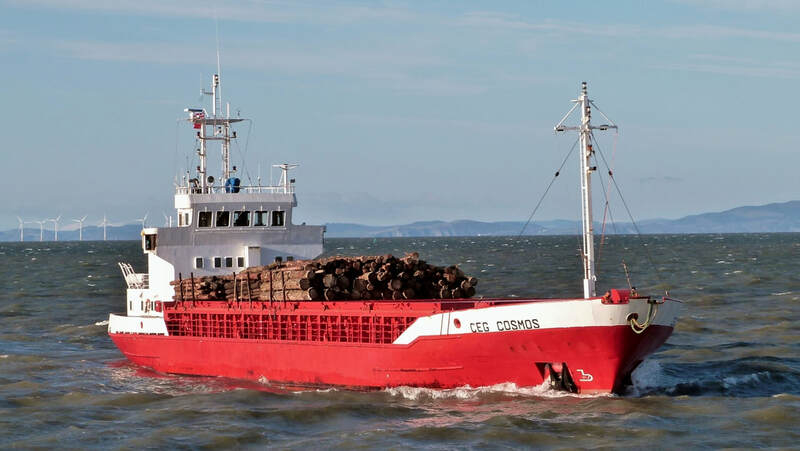 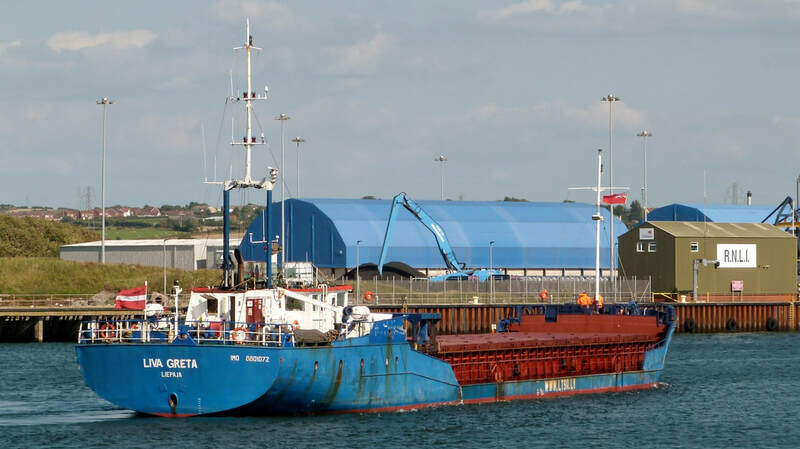 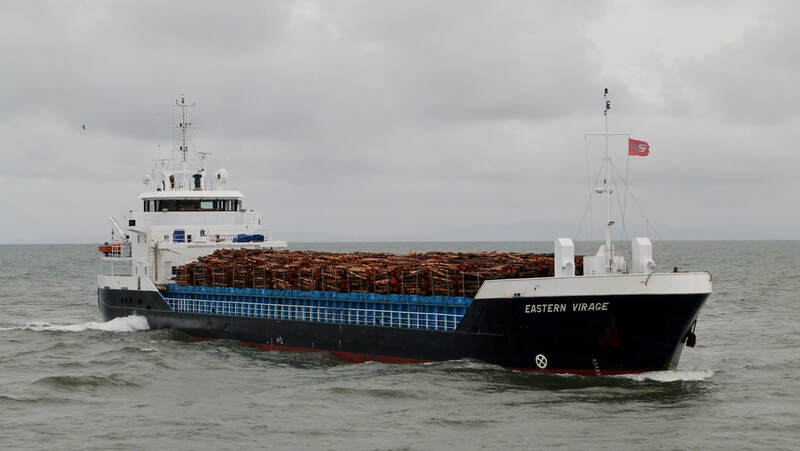 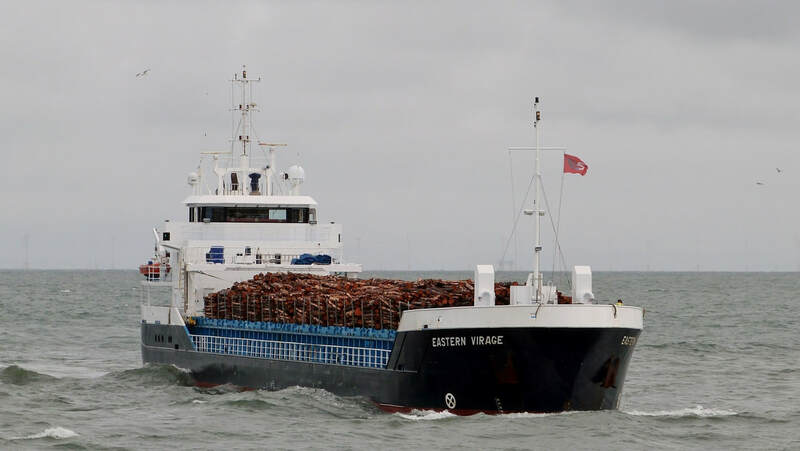 The general cargo vessel had arrived 3days earlier with round timber from Aveiro, Portugal. 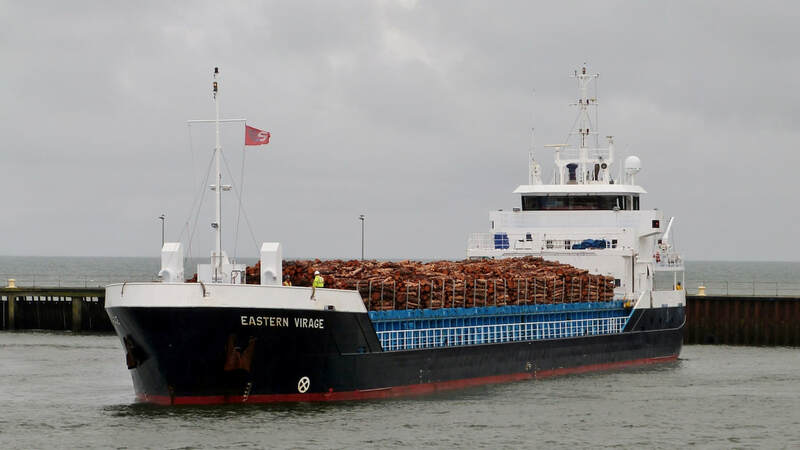 The cargo was the largest single load of timber imported by the port. The 7,750ton DWT vessel is 1 of 2 owned by a new Finnish company 'Aalto'. 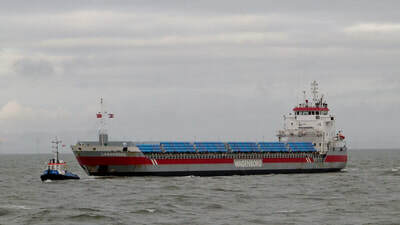 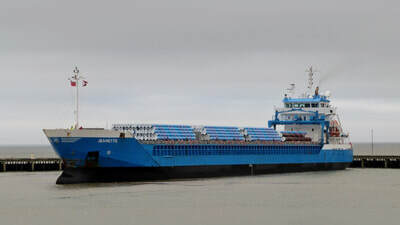 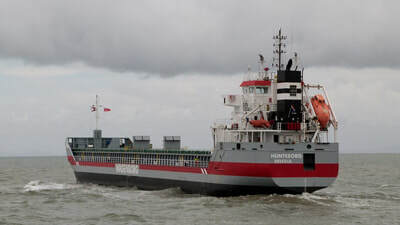 She was built in 2002 as NORDLAND and later changed hands to become VOORNEDIEP, before her latest reincarnation in 2018. 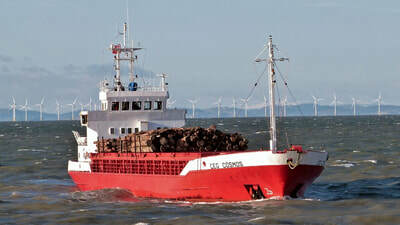 ​The gallery shows her departure with pilot tug DERWENT in attendance. 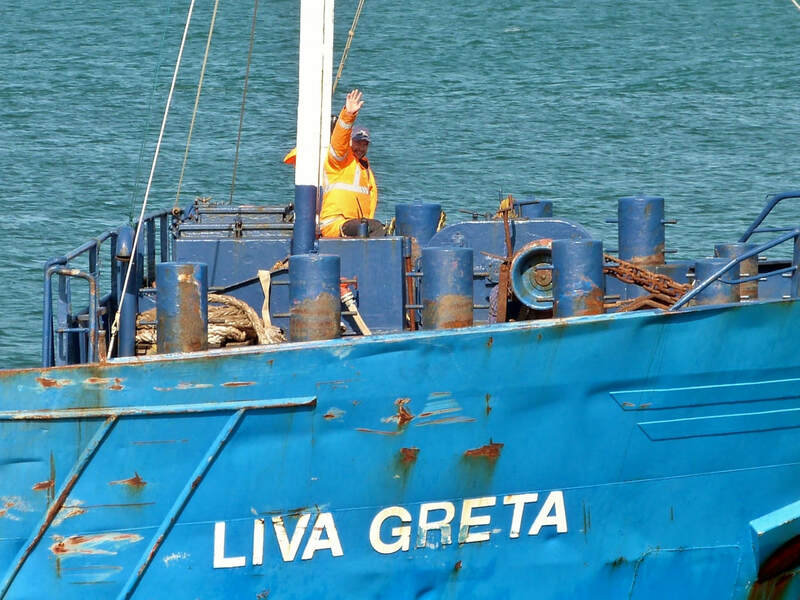 The final shot shows ARINA in the background waiting to enter port. Inbound from Inverness on a calm summer's evening. 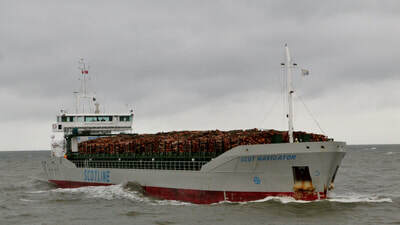 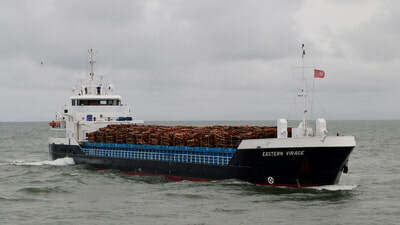 The Dutch owned general cargo vessel is on time charter to 'Scotline'. The 88m, 3,700ton DWT vessel was built in 2015 in Groningen and appeared in good order. 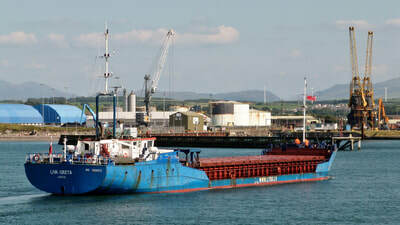 The gallery shows her passing the south pier & manoeuvring in the harbour basin. 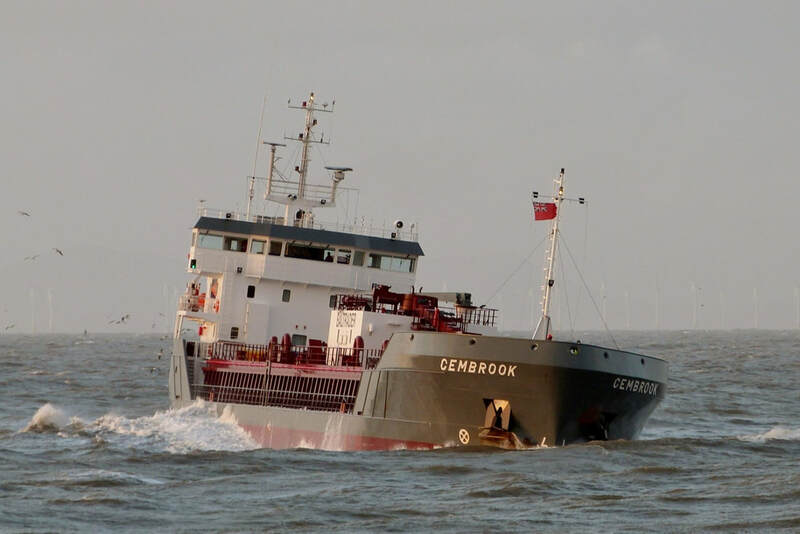 The first visit of the cement carrier. 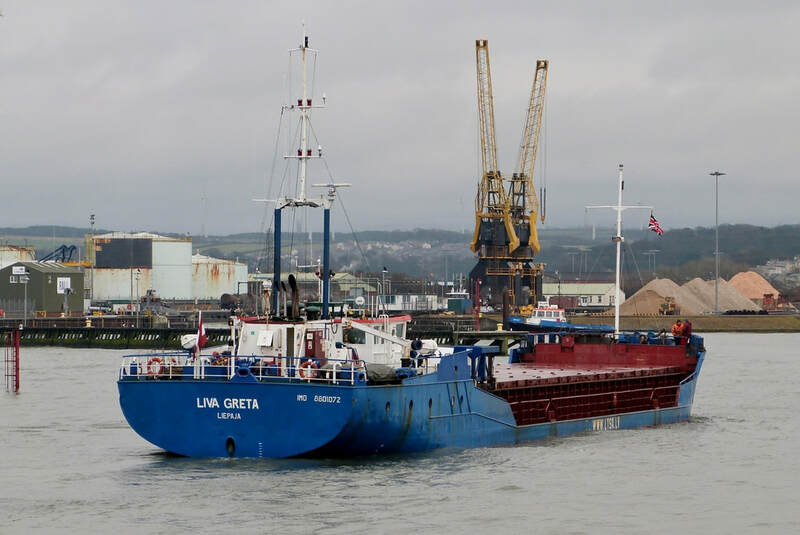 All imported powdered cement is currently sourced from Lisbon & delivered by a variety of companies. 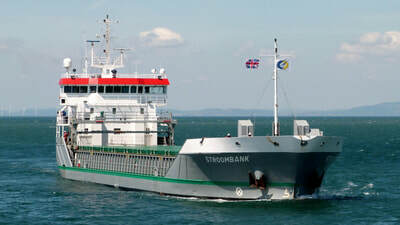 BORNHOLM belongs to 'KGJ Cement'. 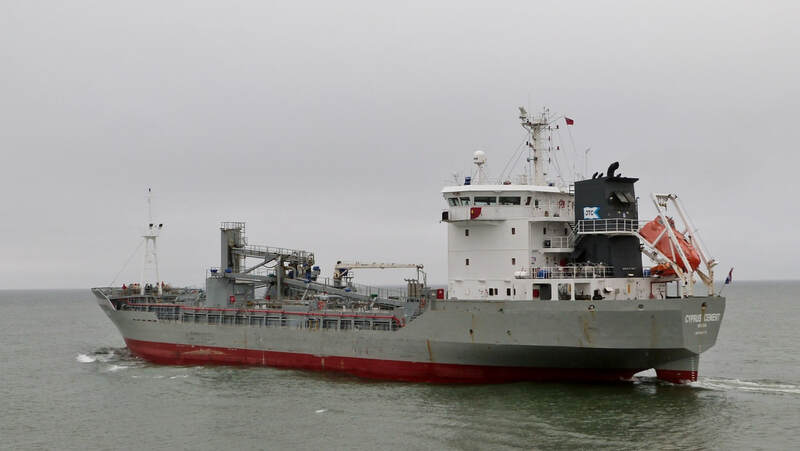 The company operates the world's largest independent fleet of pneumatic cement carriers. Those of less than 6,000tons are operated as a joint venture with 'Eric Thun (AB)'. 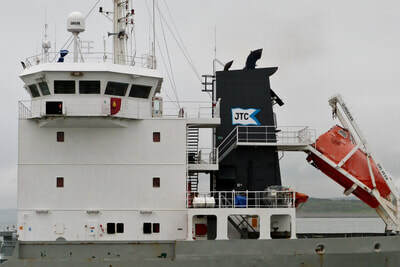 The 'JTCement' funnel logo is a reflection of this association. 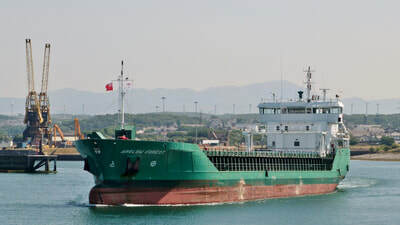 ​Built in 2008 as the general cargo vessel FLINTERFORTUNE, she was converted to a 4,500ton DWT cement carrier in 2014. Now Dutch registered, the remnants of her previous names FLINTERFORTUNE and FORTUNE can still be seen. The gallery shows her passing the south pier and reversing towards the dock entrance. 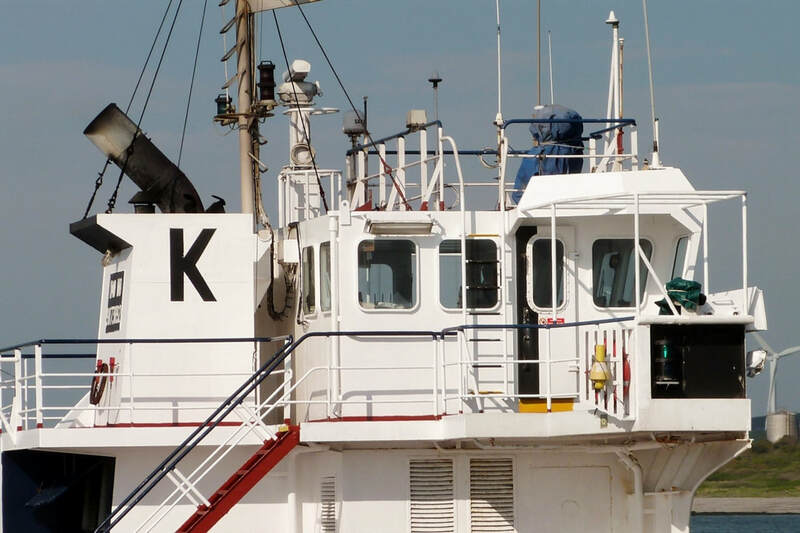 A midday arrival in bright sunshine from Aveiro, Portugal. 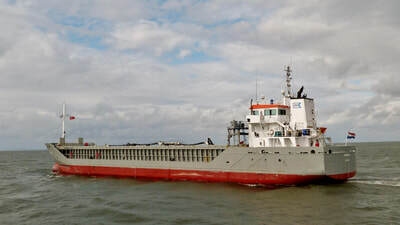 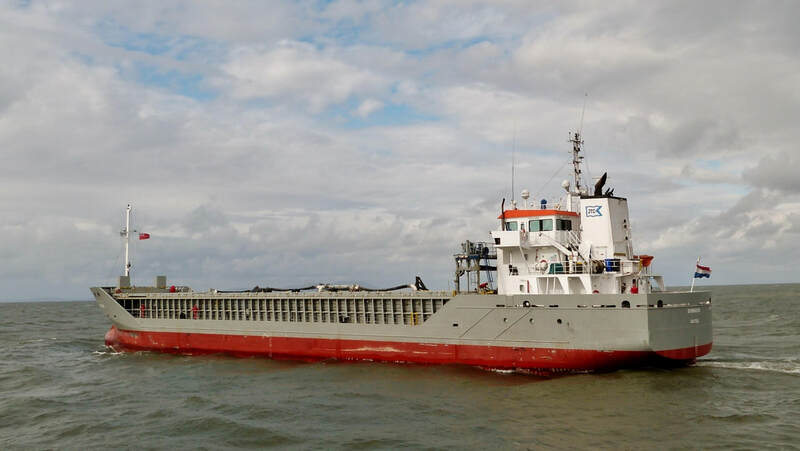 The Dutch registered (Delfzijl) 4,550ton DWT vessel was making one of a regular delivery of baled bleached wood pulp from Portugal. 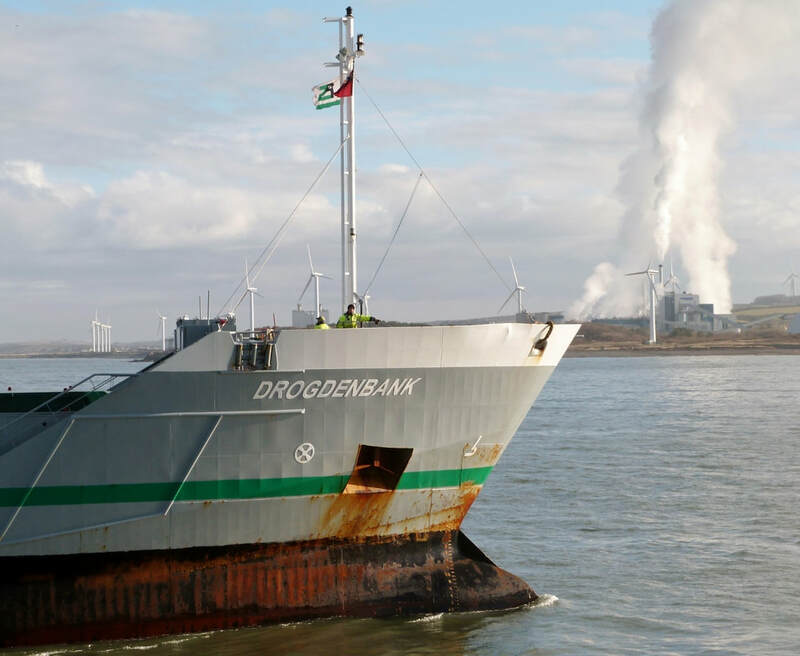 The material is used for the production of paperboard at the local Iggesund mill. 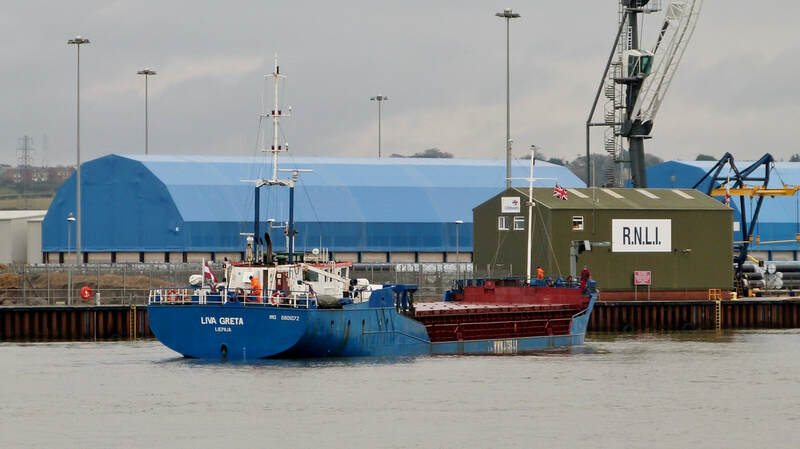 At the quayside unloading aggregate. 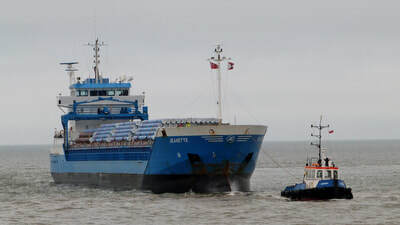 The 'ALSTERSHIP' vessel had arrived on the previous night's tide from Belfast. 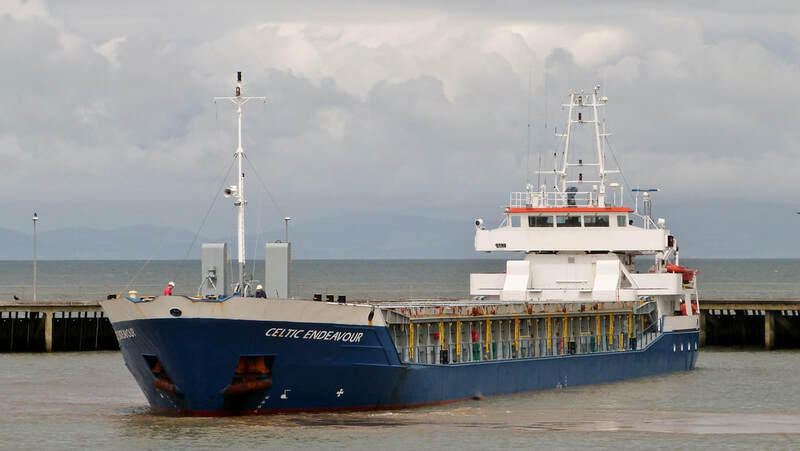 Twenty four hours later she was unloaded & ready for the return sailing to Belfast. Inbound from Lisbon on a blustery afternoon. 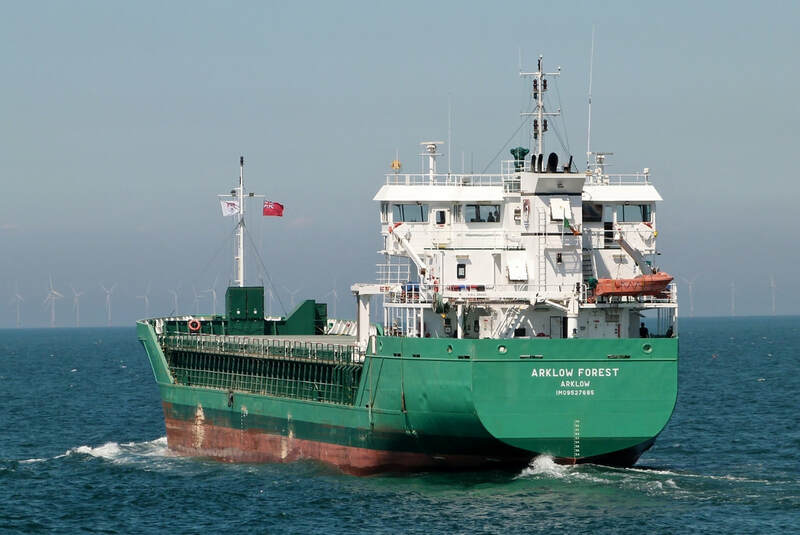 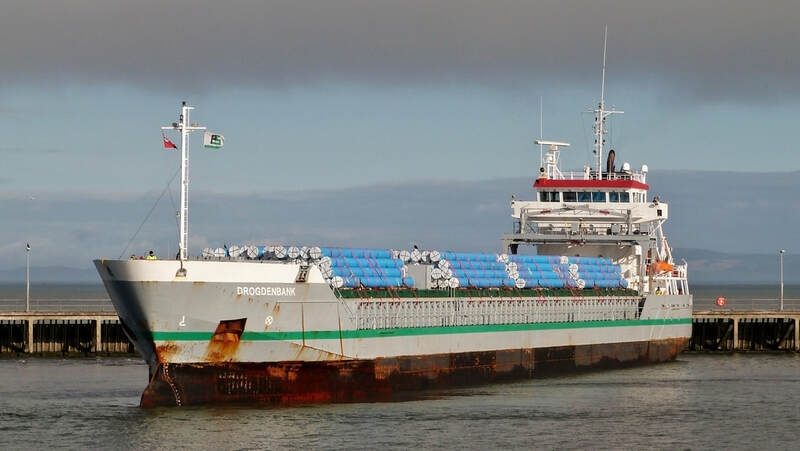 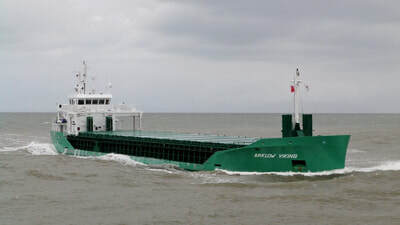 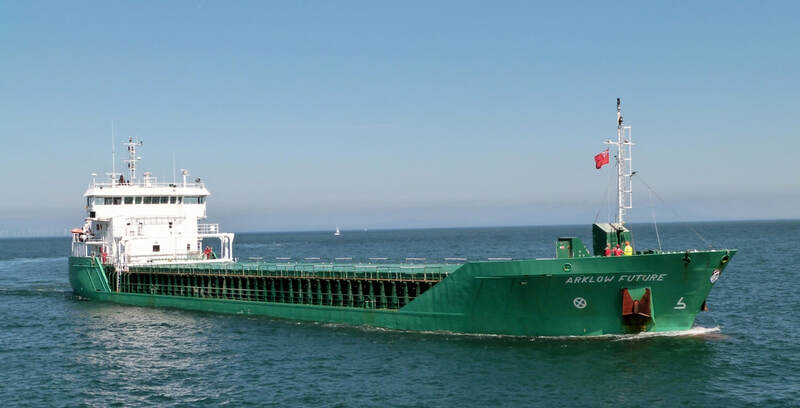 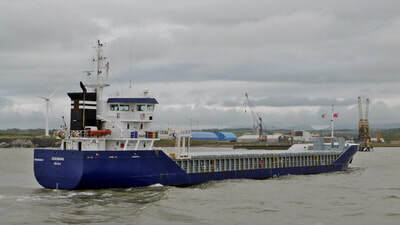 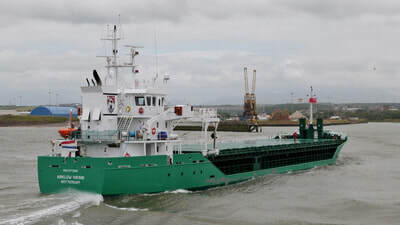 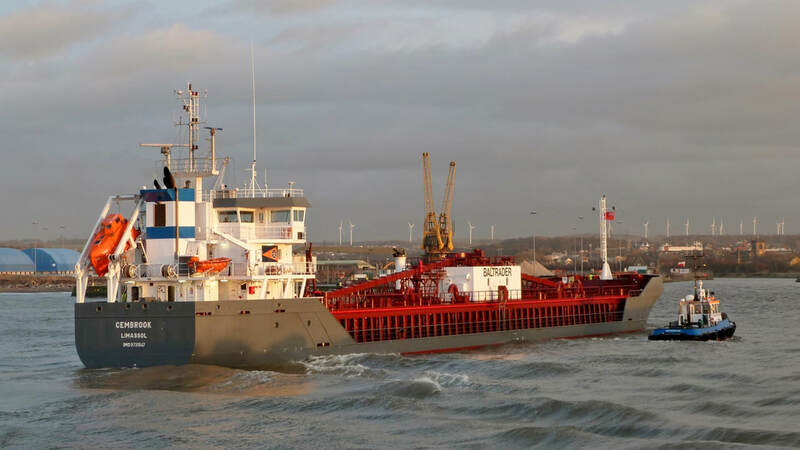 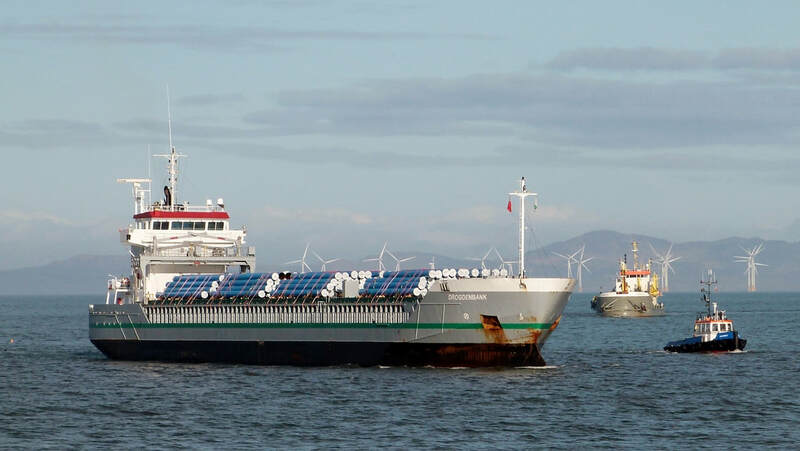 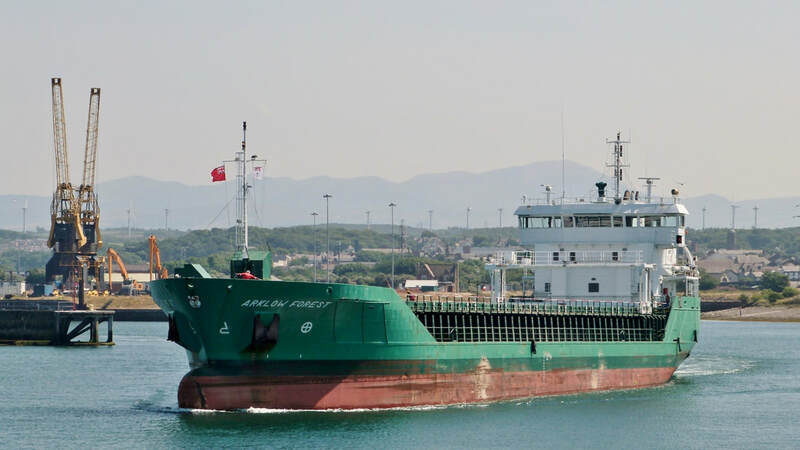 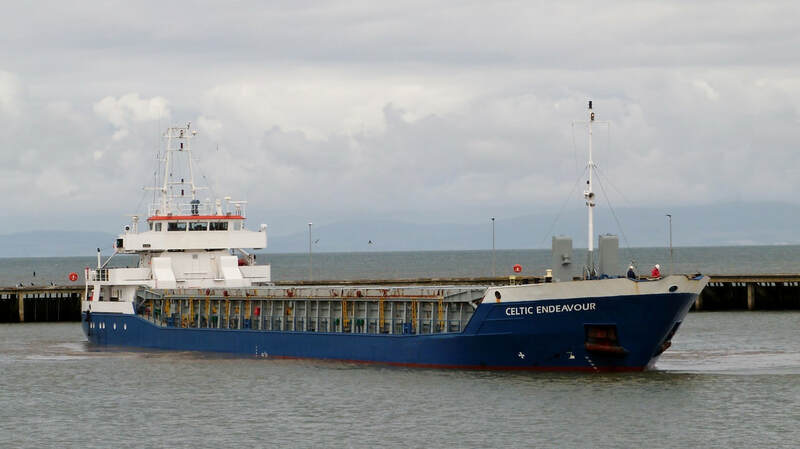 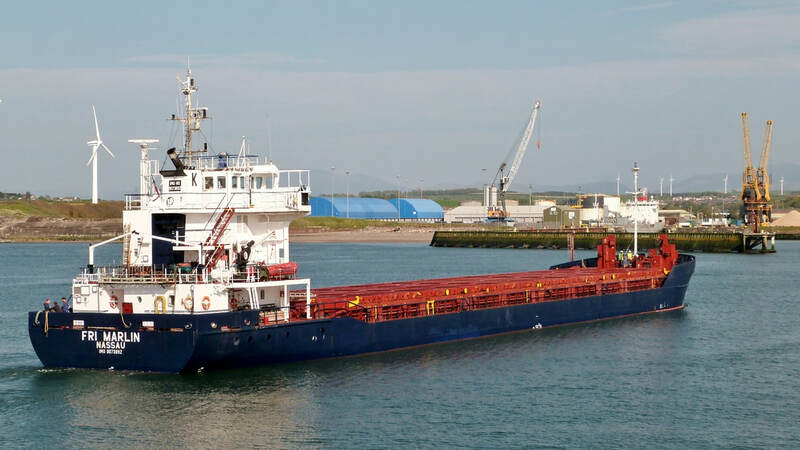 Arklow's recent addition to the fleet, launched in February 2018, arrived with a full load of powdered cement from Portugal Keen to enter port the approach was begun 90min before high water. 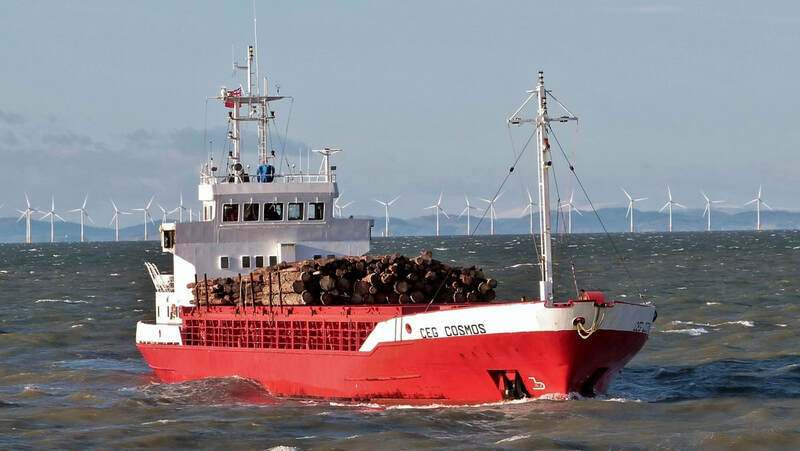 The 87m, 5,100ton DWT vessel coped well with the strong southwesterly but after entering the harbour basin veered towards the north pier. 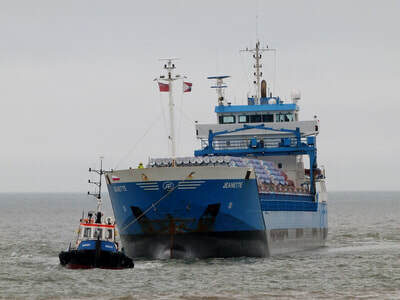 This unusual course shown in final photo of the gallery was soon corrected & the vessel manoeuvred to enter dock bow first. 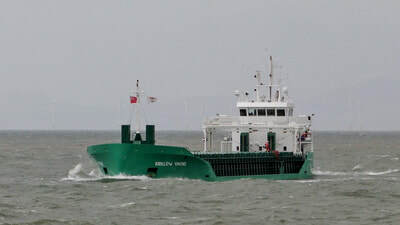 Outbound on a grey, breezy afternoon. 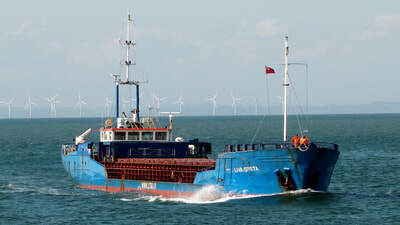 ​The second visit of the 'Wagenborg' vessel bringing pipework from Almeria for United Utilities' Thirlmere water abstraction project. 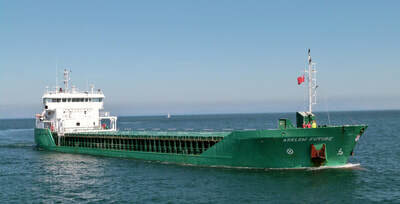 ​The 114m, 5,650ton DWT vessel had spent 3days at the port. 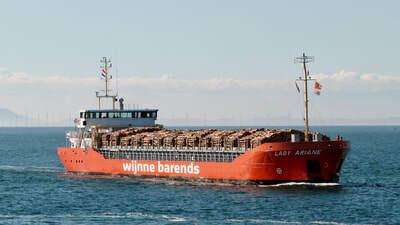 Having just finished unloading she was keen to get away to Wandelaar to await orders. 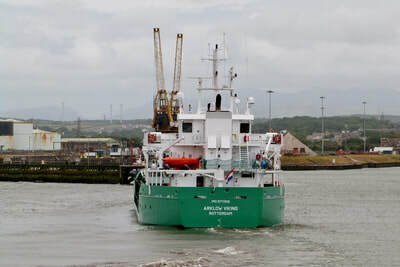 ​The gallery shows her manoeuvring past the north pier into the Solway accompanied by pilot tug DERWENT. 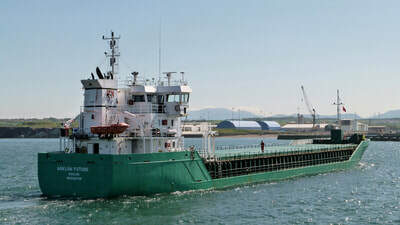 Inbound from Lisbon with powdered cement. Seen opposite a navigation light in Workington harbour basin. 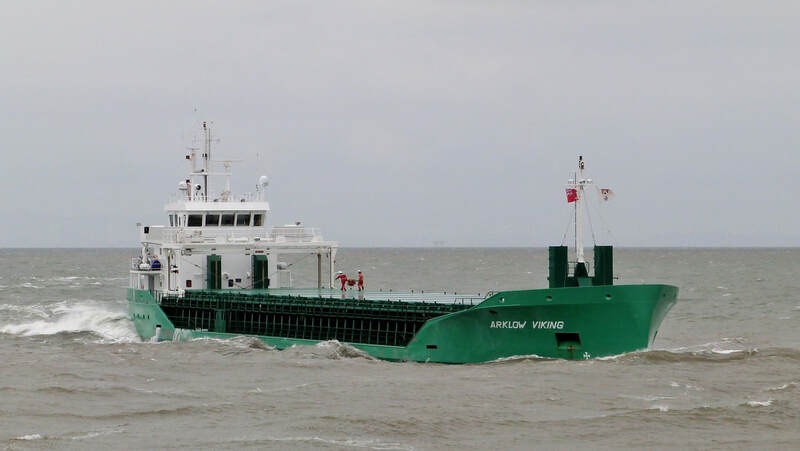 The vessel looked in good shape as is usual with the 'Arklow' fleet. 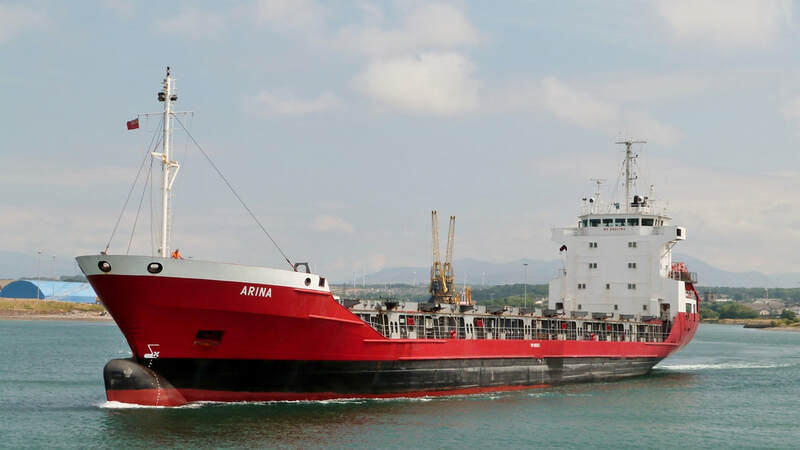 The 90m, 4,500ton DWT vessel was built in Spain in 2008. 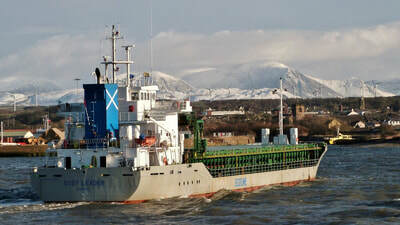 Outbound for Corpach after delivering timber from Scrabster. TRADER is one of the less frequent visitors from the 'Scotline' fleet. 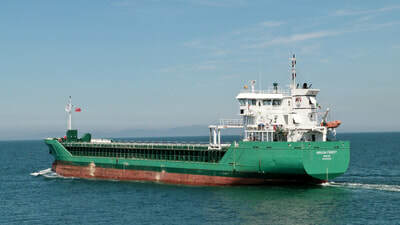 This was her first visit of the year and she didn't call once during 2017. 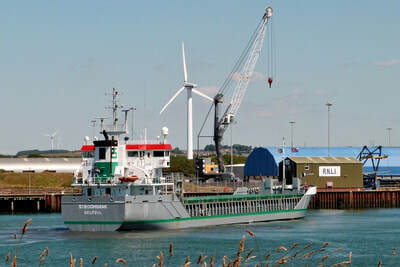 ​Inbound from Dordrecht, Netherlands with furnace bottom ash for the construction industry. 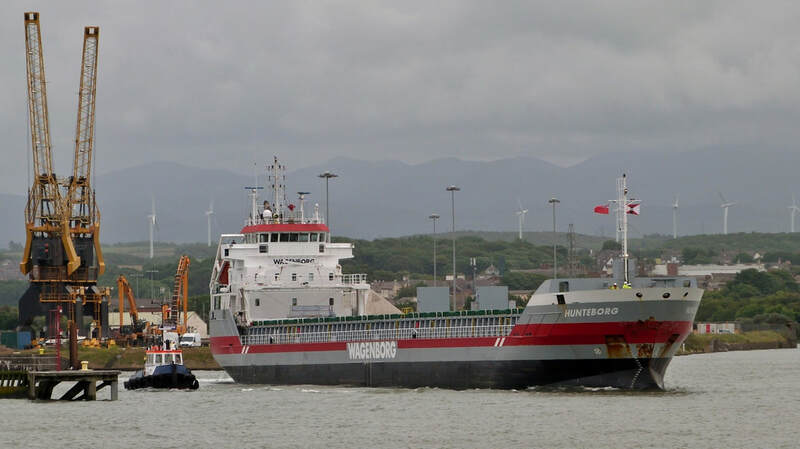 The 3,600ton DWT general cargo vessel is a new visitor to the port. 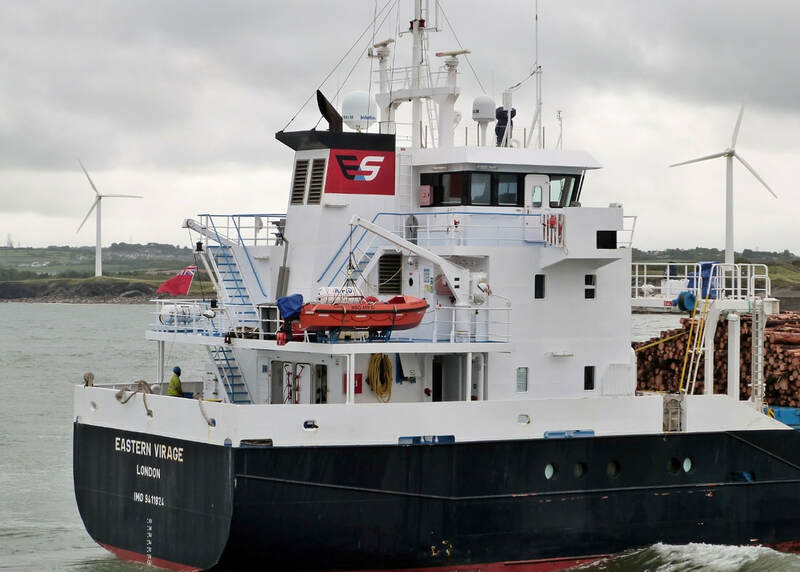 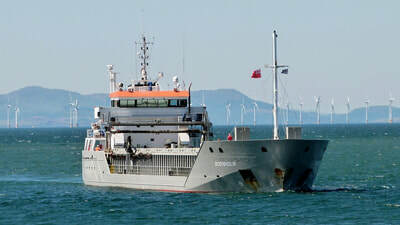 She bears the 'ES' logo indicating 'Strahlmann Shipping' which comprises a fleet of about 50 vessels. Poor visibility after the drizzle had eased for the departure to Germany. 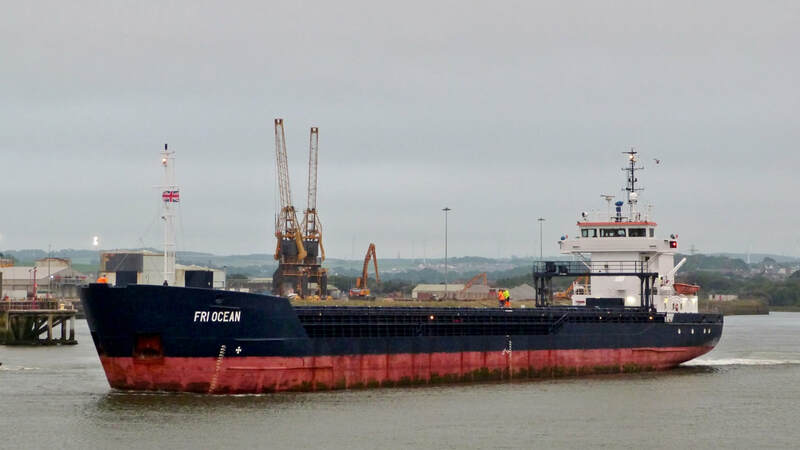 The 5,500ton DWT vessel had made her first visit with a delivery from Lisbon. 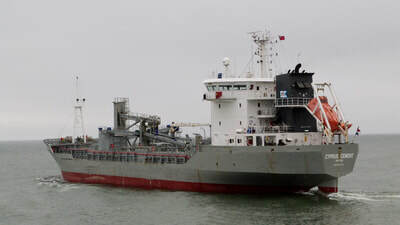 The vessels belongs to 'KGJ Cement'. The company operates the world's largest independent fleet of pneumatic cement carriers. Those of less than 6,000tons are operated as a joint venture with 'Eric Thun (AB)'; the 'JTCement' funnel logo is a reflection of this. 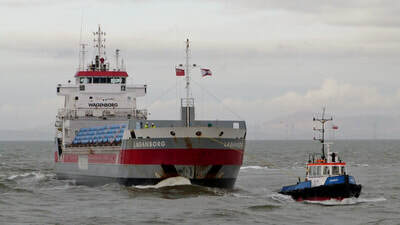 The departure proceeded without incident unlike that from Levanger, Norway in July 2013 when she collided with pleasure craft moored in the marina (YouTube Video). No one was injured but the vessel was detained for an investigation. 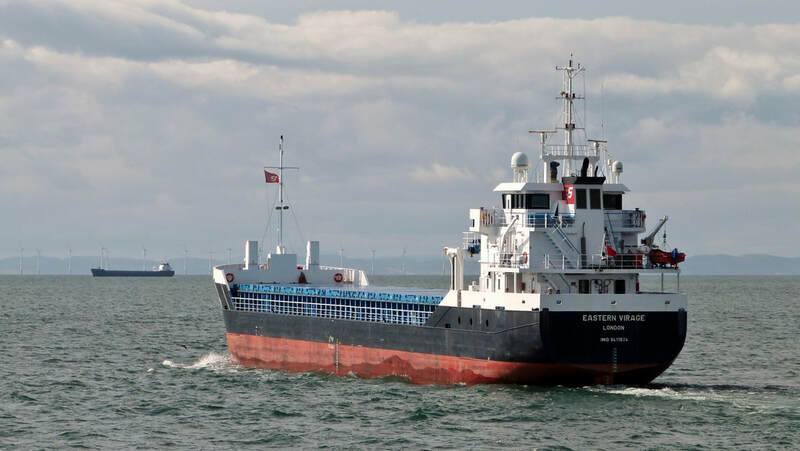 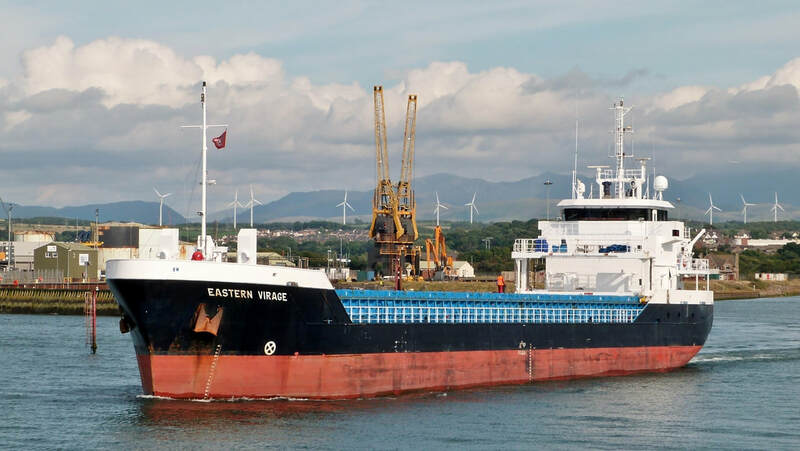 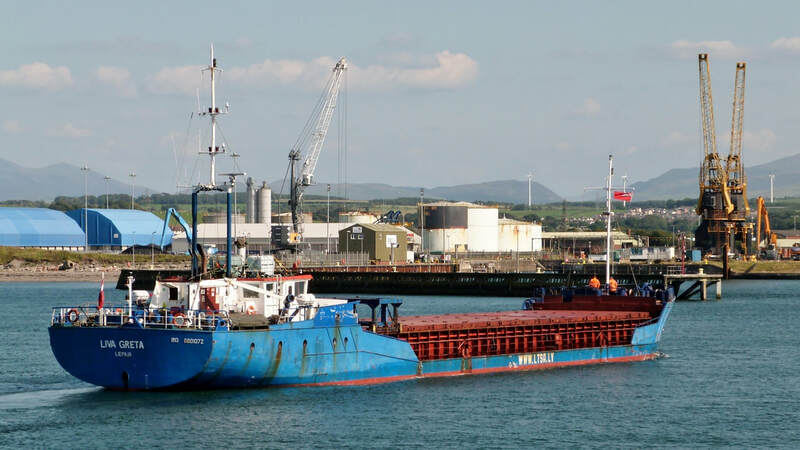 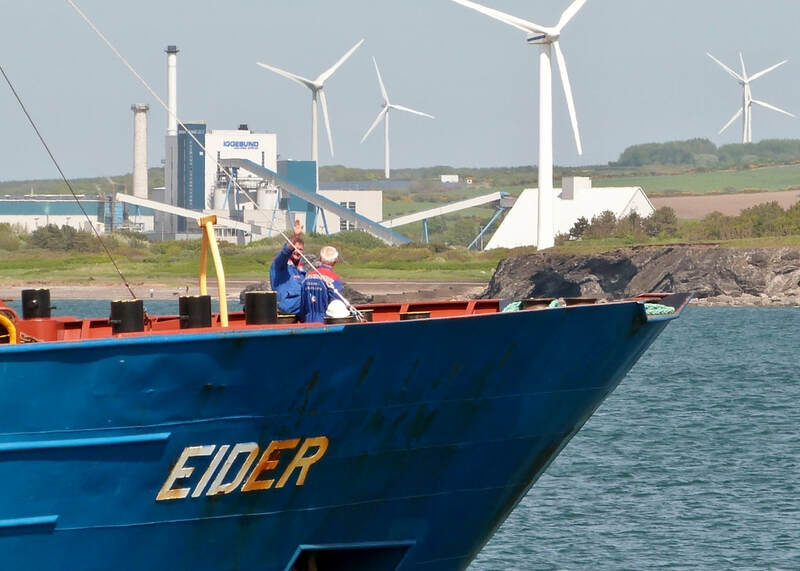 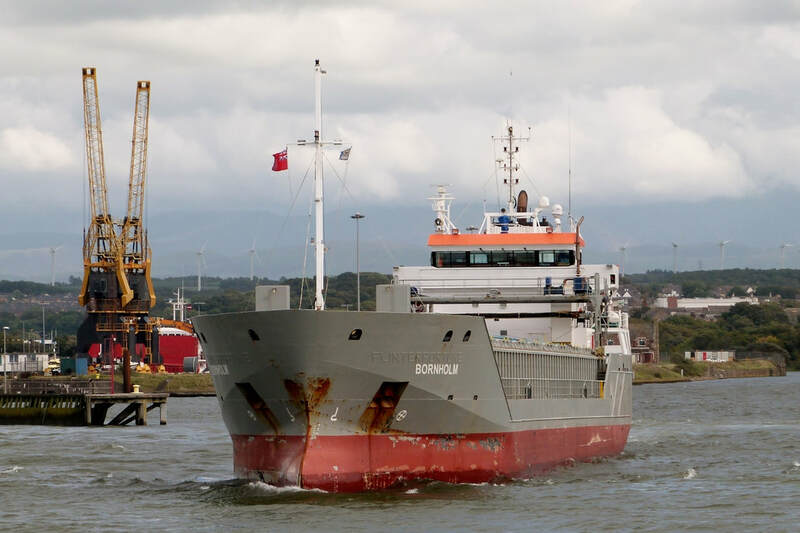 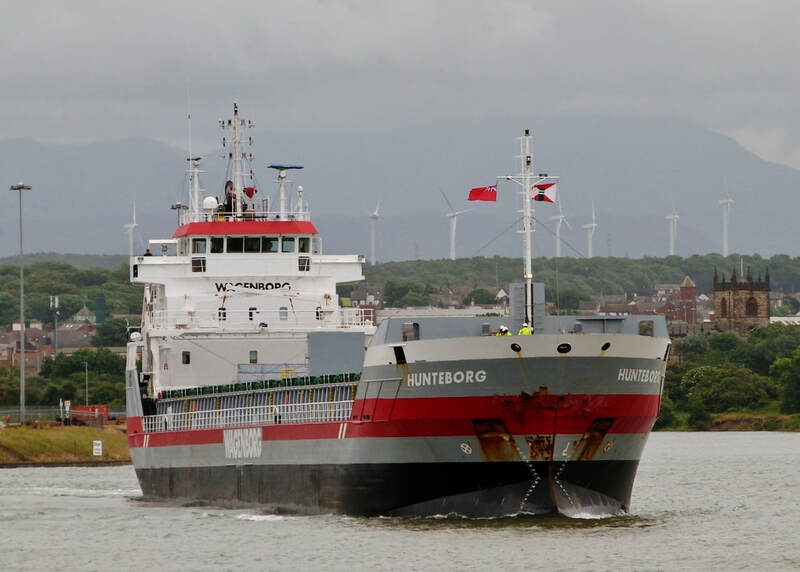 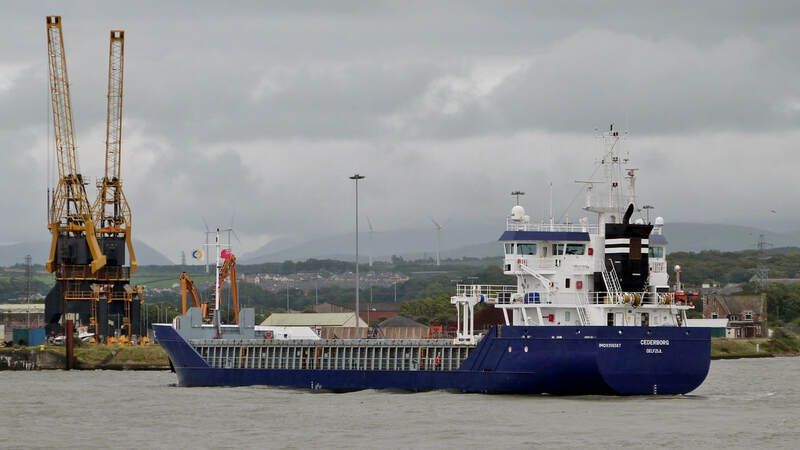 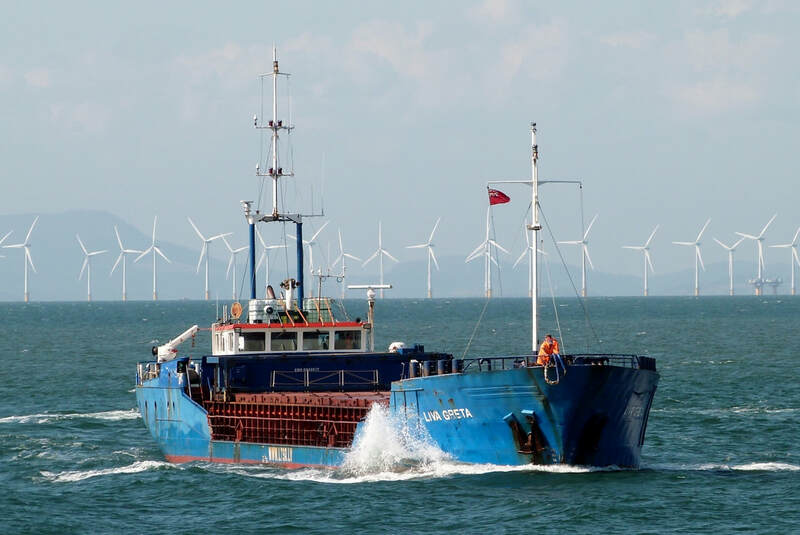 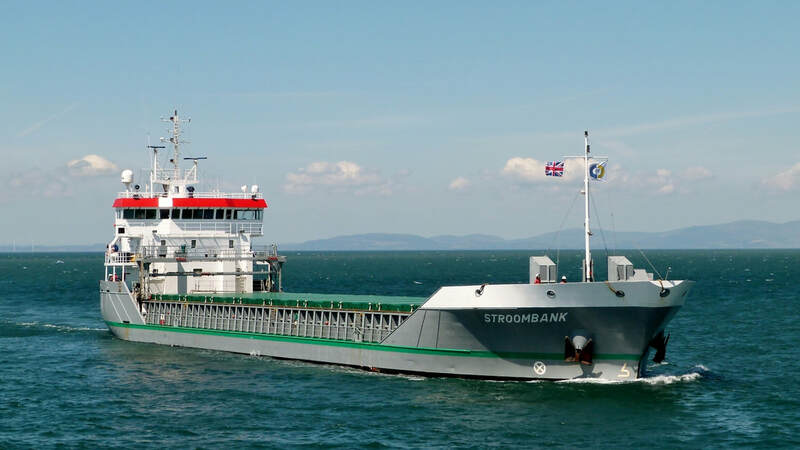 The delivery of wheat destined for Silloth Mill was to be partly offloaded at Workington due to the arrival coinciding with a cycle of neap tides affecting access to Silloth. 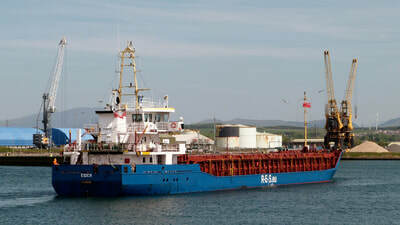 ​The 88m 3,000ton DWT vessel bears the funnel emblem of the 'KOPERVIK GROUP' but is not listed on their website's fleet list. 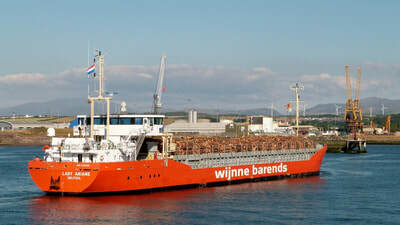 Inbound from the Mediterranean port of Almeria with pipework for United Utilities Thirlmere water abstraction project. 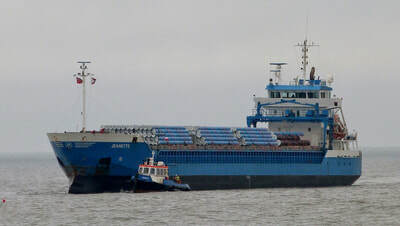 Seen arriving on a disappointingly dull afternoon after a 6day sailing from Spain. ​The cargo consists of plastic-lined pipework manufactured by 'Noksel' at their Lorca site, 70miles from the port of Almeria. ​The 110m, 6,000ton DWT vessel was built in 2007. 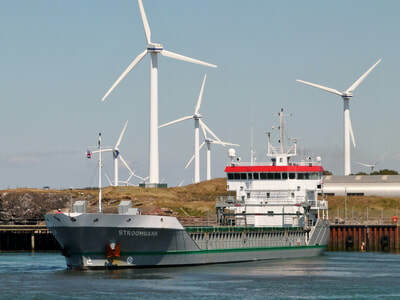 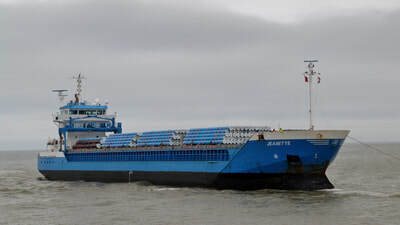 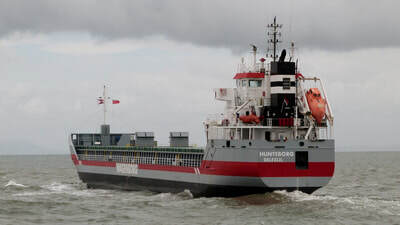 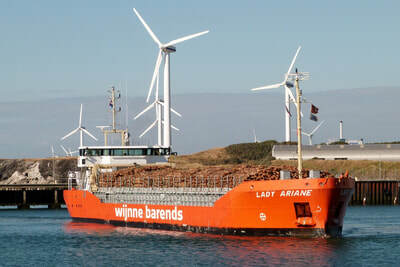 She is owned by 'ANET Shipping' of Delfzijl and managed by 'Wagenborg'. 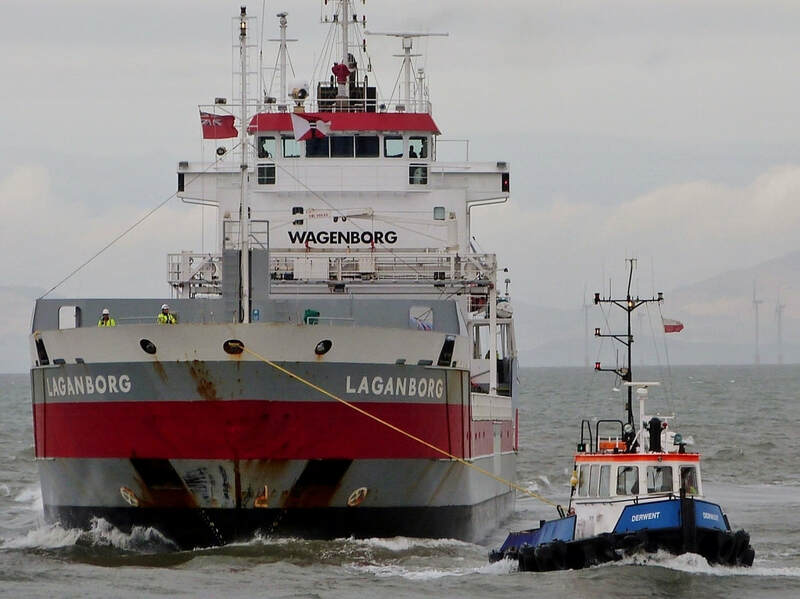 ​The gallery shows a line being attached to pilot tug 'DERWENT' for extra control in the blustery conditions. 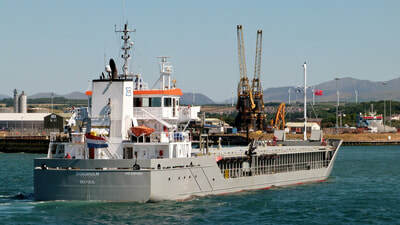 Inbound from the Spanish port of Almeria with pipework for United Utilities Thirlmere water abstraction project. 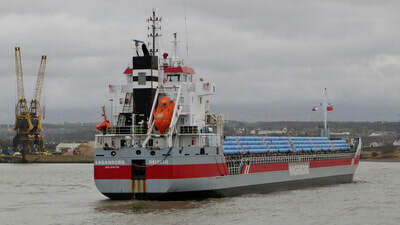 Seen above reversing into the dock having turned in the harbour basin with the help of pilot tug DERWENT. 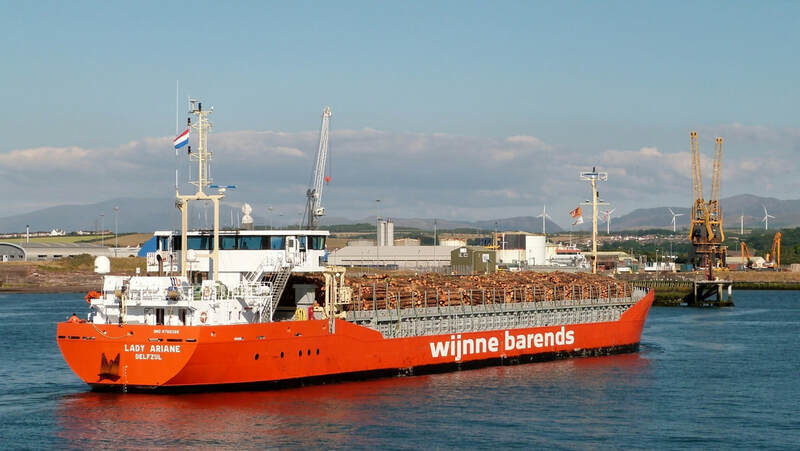 ​This is the sixth delivery of pipework from the Mediterranean port, a 5day sailing. ​The Dutch registered (Delfzijl) 6,000ton DWT vessel is one of a fleet of eleven owned by 'Pot Shipping'. 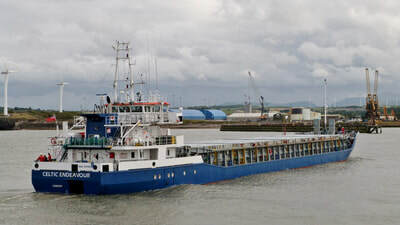 in addition to the usual technical details of the fleet, the website has a link showing the present positions of the whole fleet. 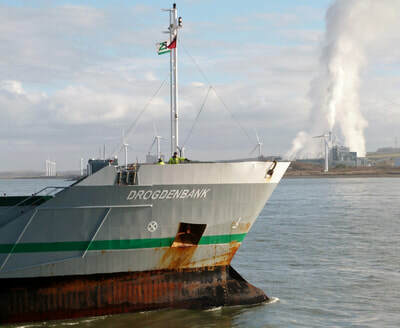 ​The gallery below shows DROGDENBANK making her approach with dredger SOSPAN-DAU waiting in the background. 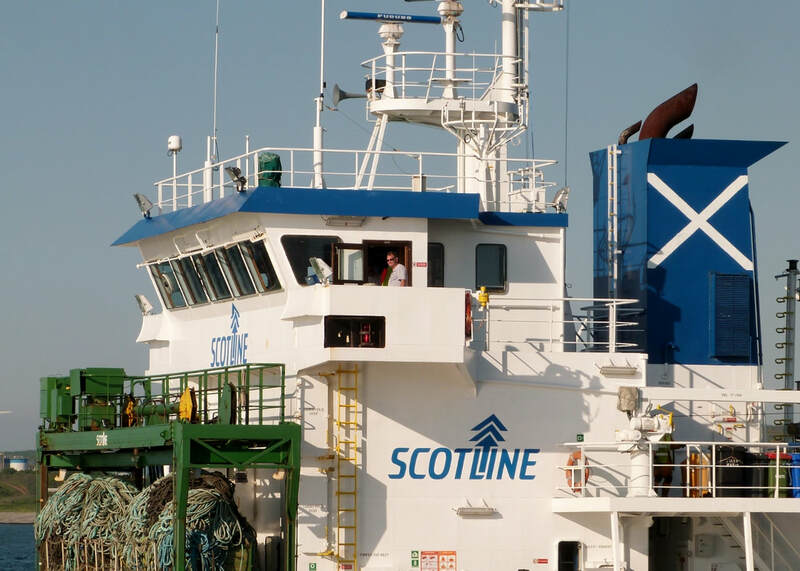 The 'Scotline' vessel enters port following the arrival of CEG COSMOS 30min earlier (see below). After a 7day sailing from Sweden SCOT LEADER was made to wait until COSMOS was safely turned & moored alongside her berth. 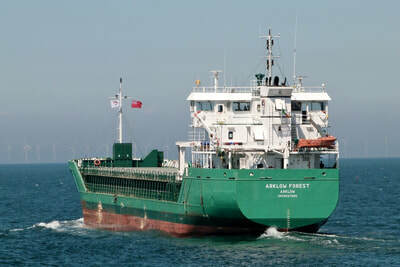 It's the second visit of the year from the 4,500ton DWT ex 'ODERTAL'. 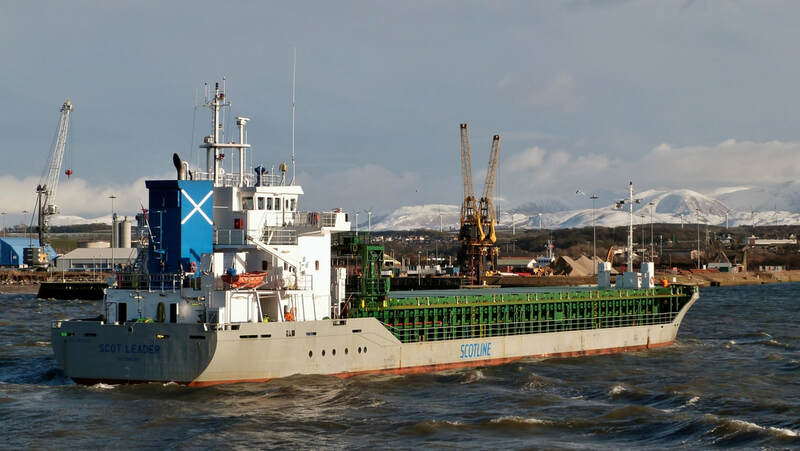 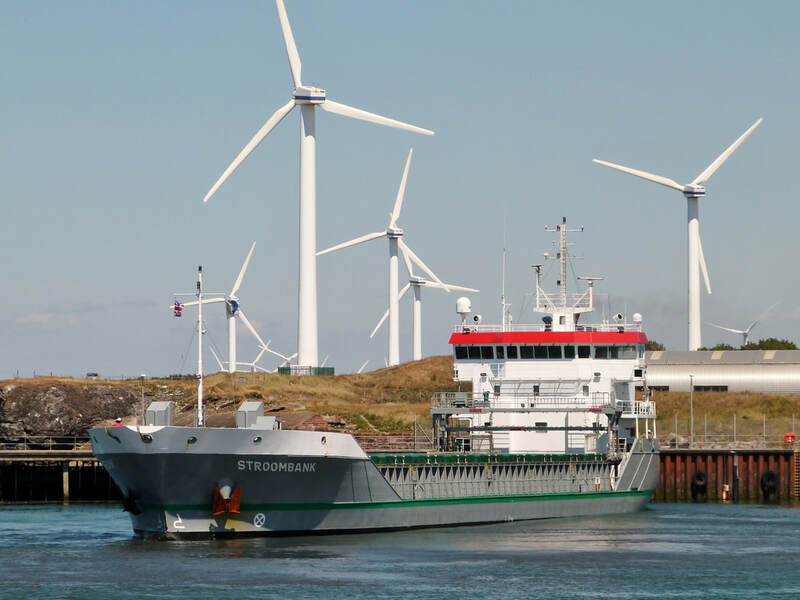 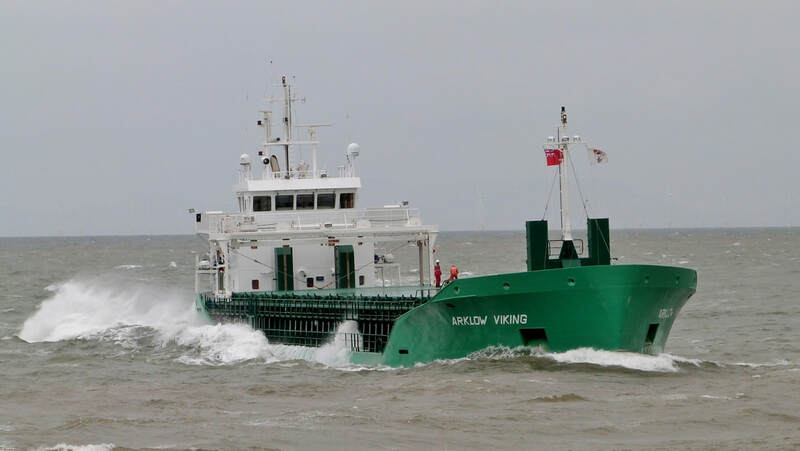 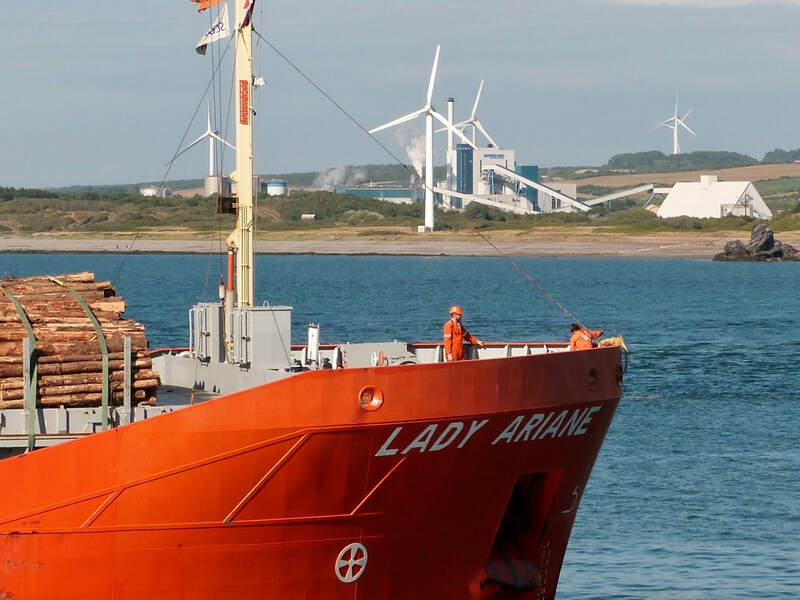 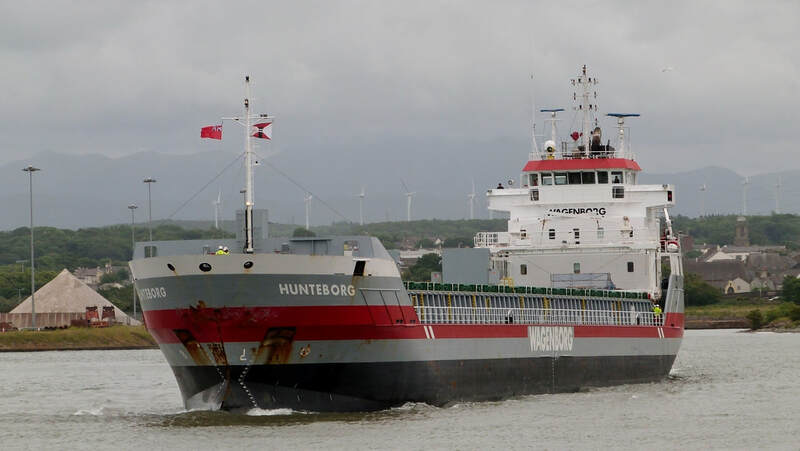 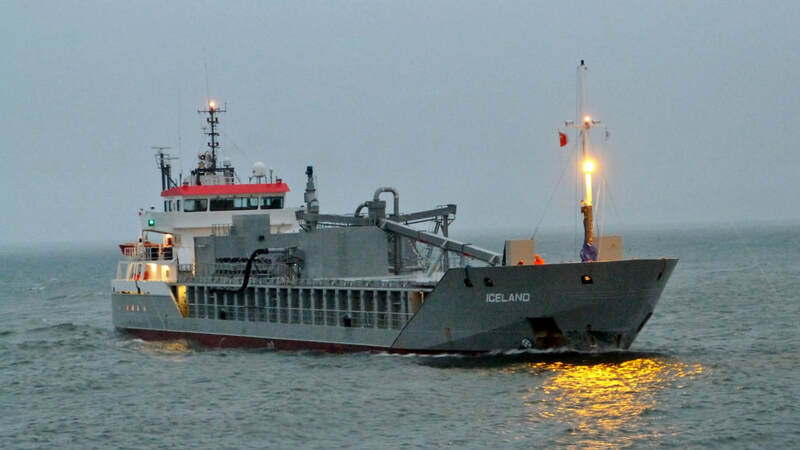 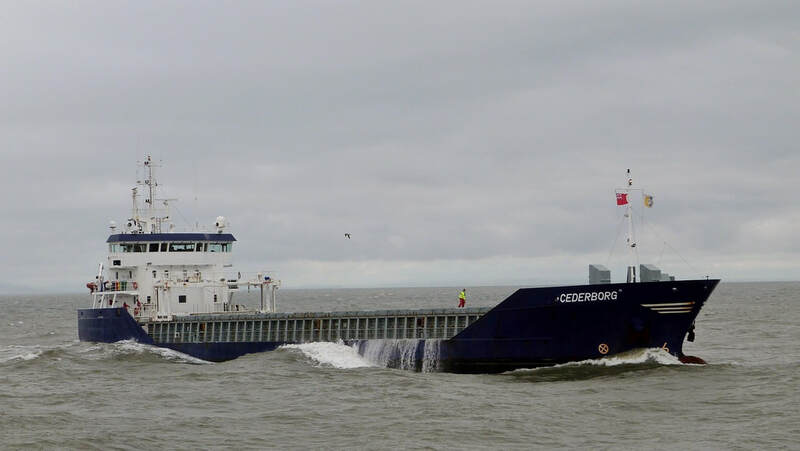 On this occasion she was delivering baled wood pulp from the Skärnäs Terminal, a facility owned by the 'Holmen Group', the parent company of the Iggesund Mill at Workington. 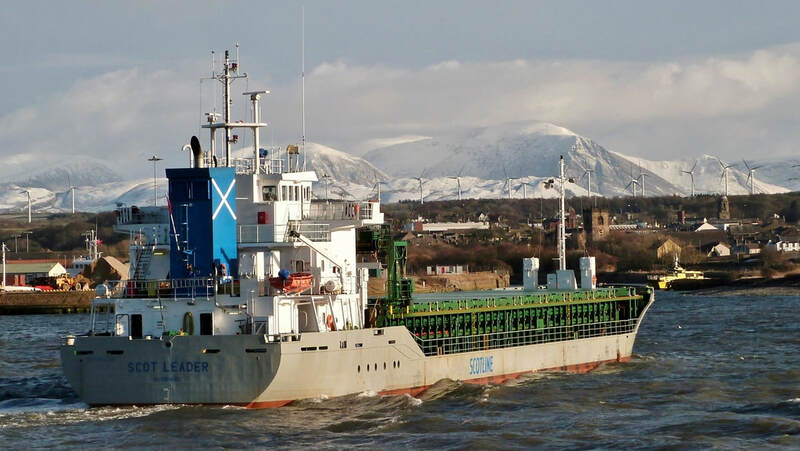 Inbound from Lochaline on a crisp winter afternoon. 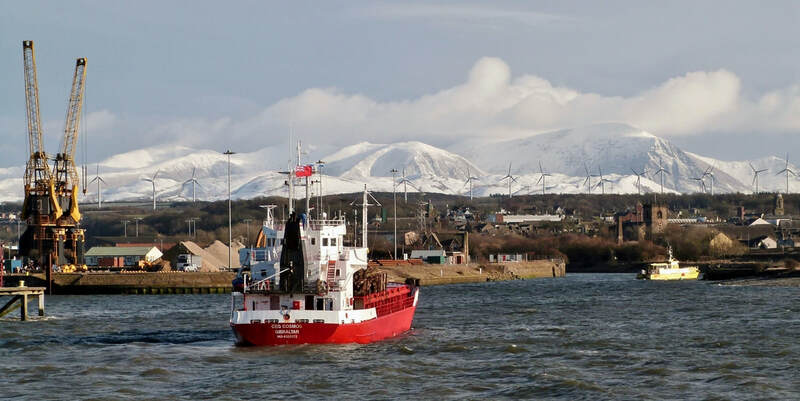 The Western Fells have a covering of fresh snow. The Gibraltar flagged coaster has been a regular on the West of Scotalnd timber route since 2014. 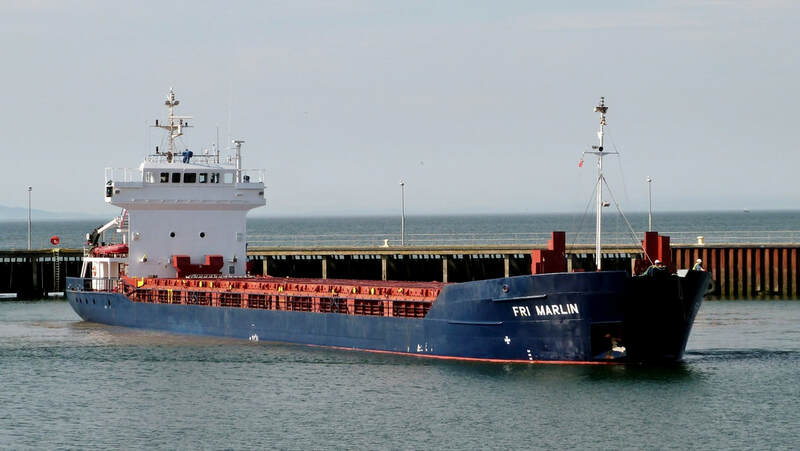 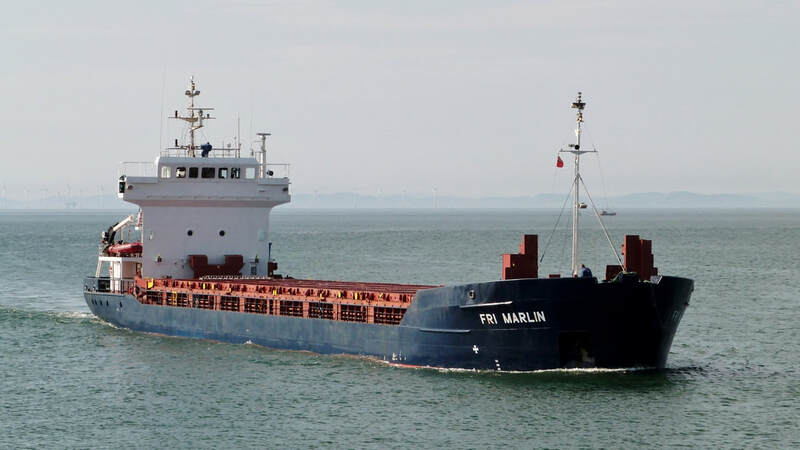 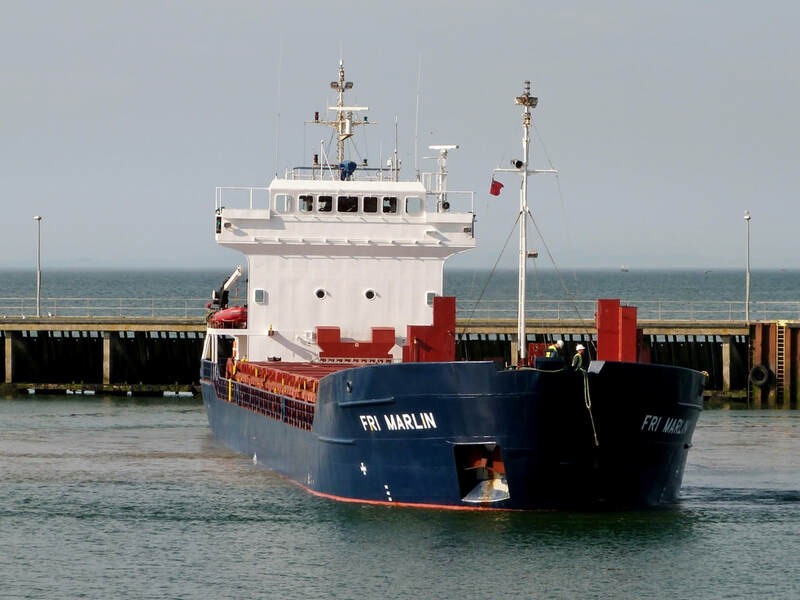 At 1,100ton DWT she is the smallest vessel in the fleet operated by 'Fehn Ship Management'. A new visitor with timber from Corpach. 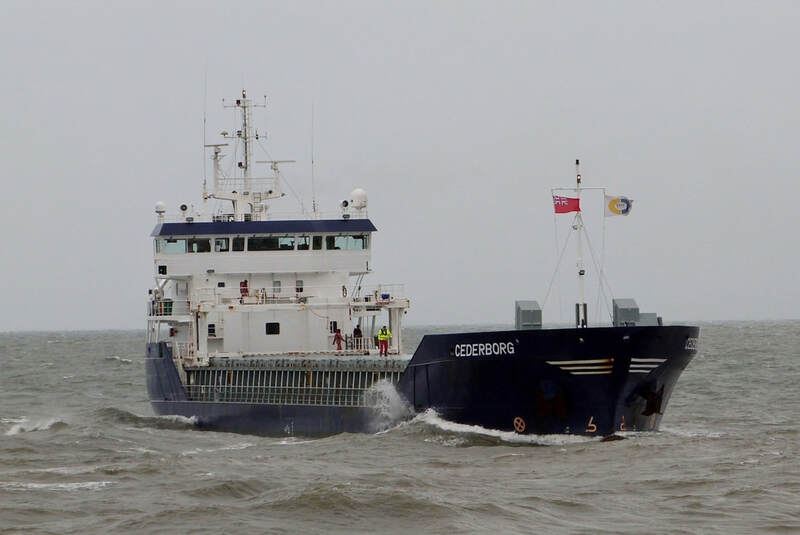 ​The 64m 1280ton DWT Latvian registered general cargo vessel made her entrance on a damp winter afternoon. 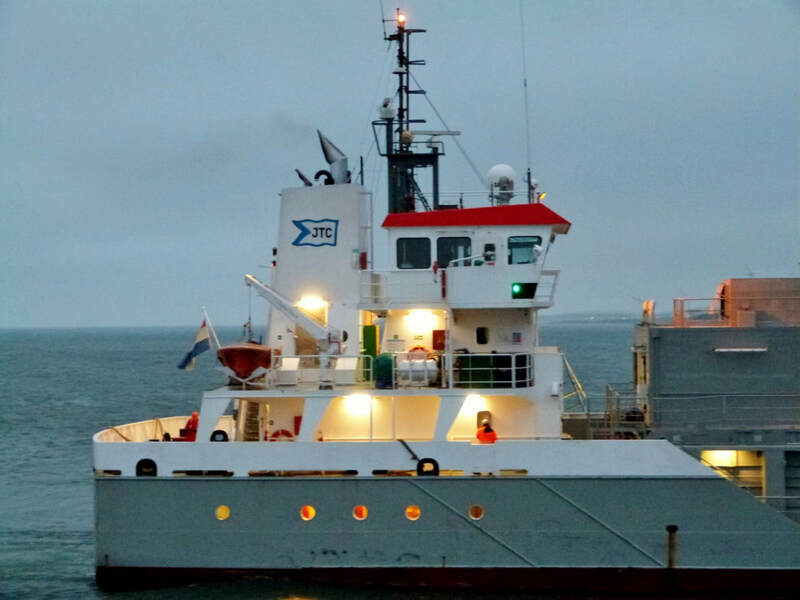 Despite the weather, the crew look happy with their new destination. 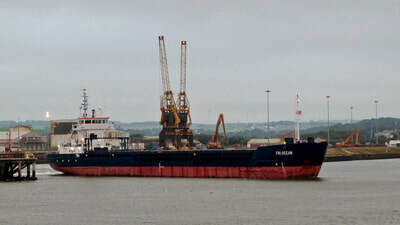 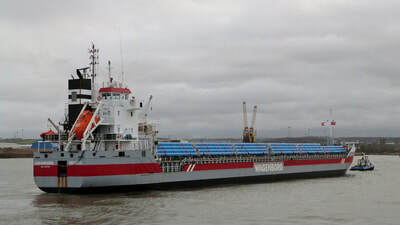 ​The cargo was discharged the following morning & she was soon on her way to Liverpool. Inbound on a grey morning after a 6day sailing from the Mediterranean port of Almeria. The 122m 6,700ton DWT vessel is amongst the largest handled at the port. ​A line was attached to pilot tug DERWENT for additional control during the approach towards the harbour basin. 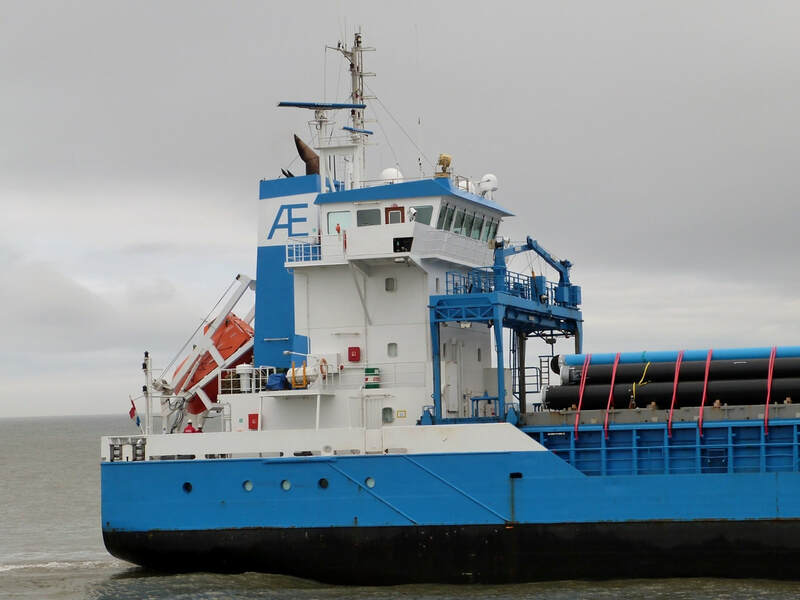 ​The cargo of steel pipes was destined for United Utilities Thirlmere water abstraction project which involves the construction of a 60mile pipeline to West Cumbria. 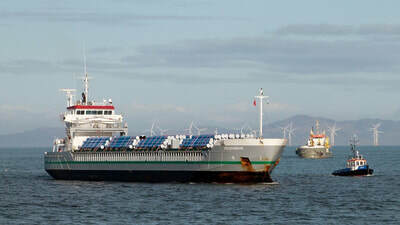 The plastic-lined pipework is manufactured at 'Noksel's' site at Lorca, 70miles from the port of Almeria. 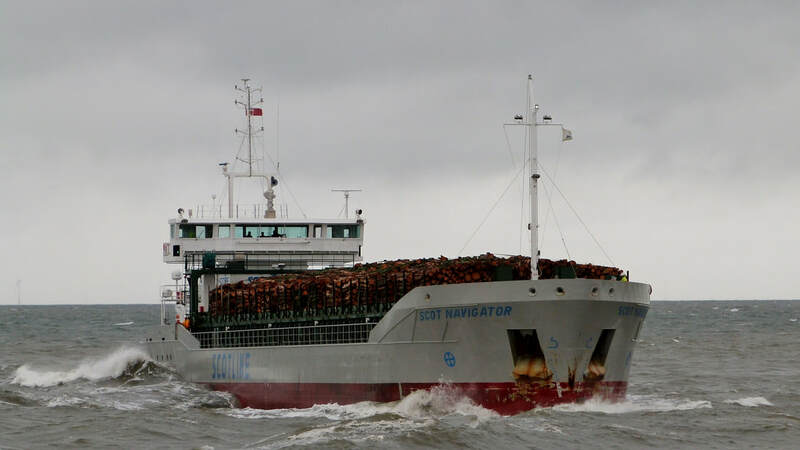 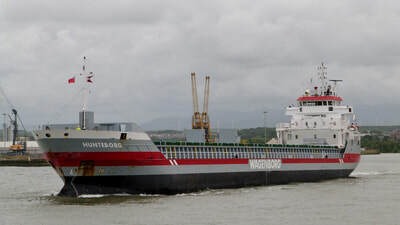 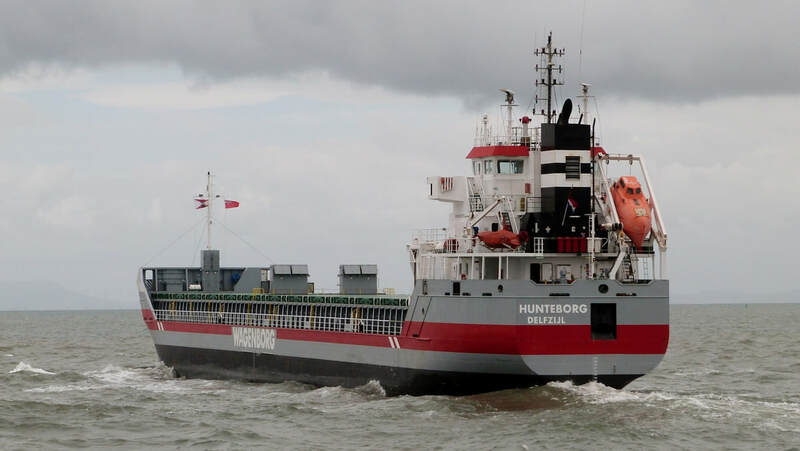 ​This was the fifth delivery by 'Wagenborg' vessels. 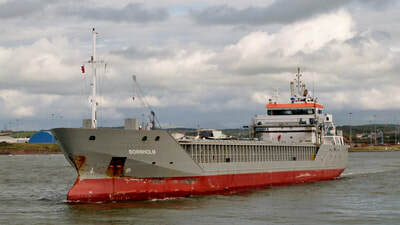 Inbound from Lisbon with powdered cement. 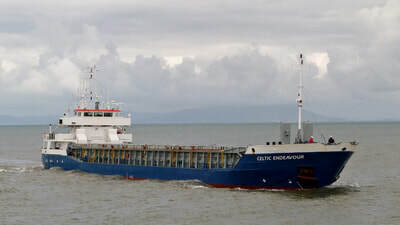 The cement carrier arrived in the wake of Storm Georgina having sheltered in Ramsey Bay for 12hrs before making her final approach. 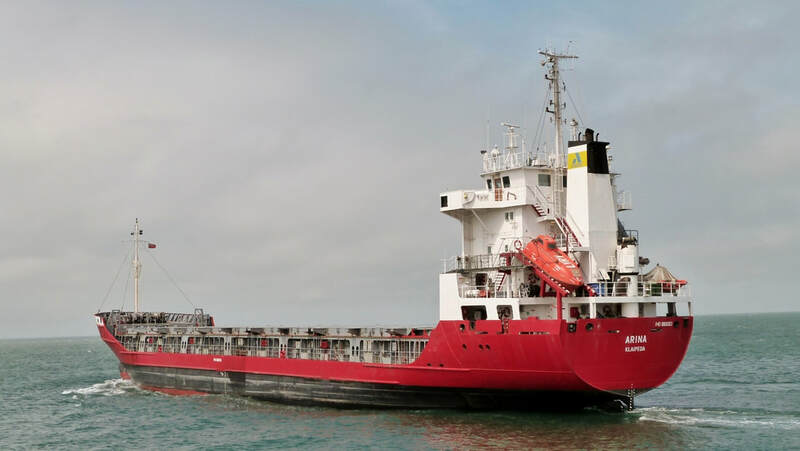 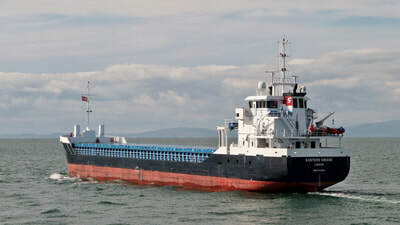 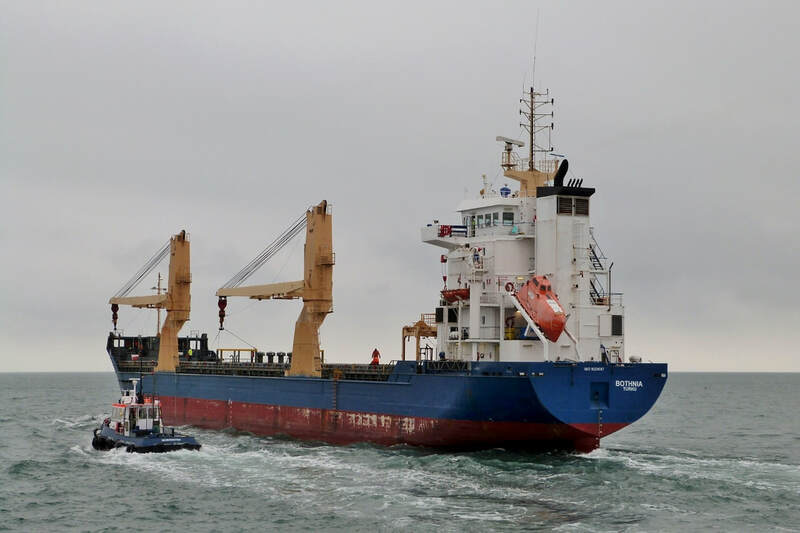 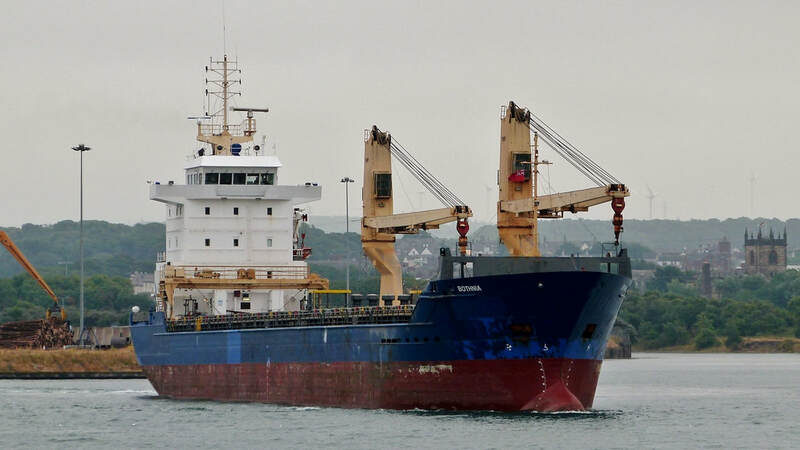 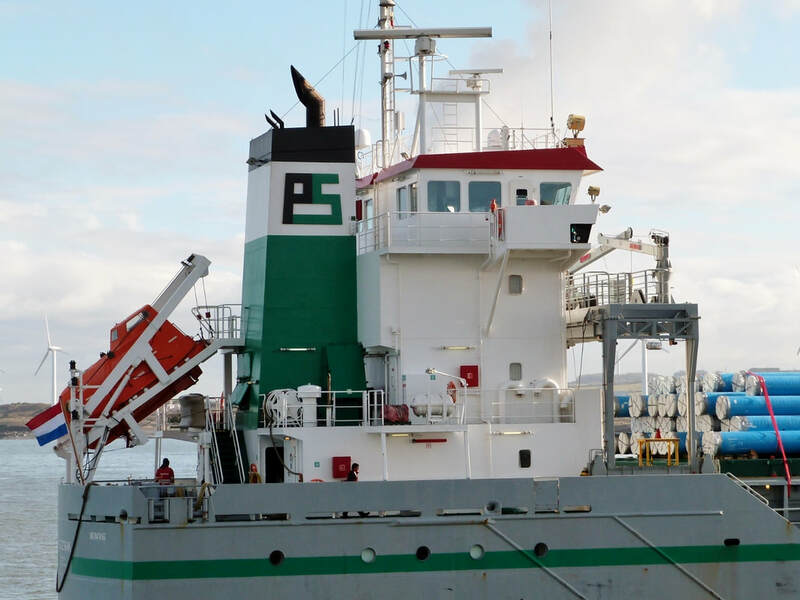 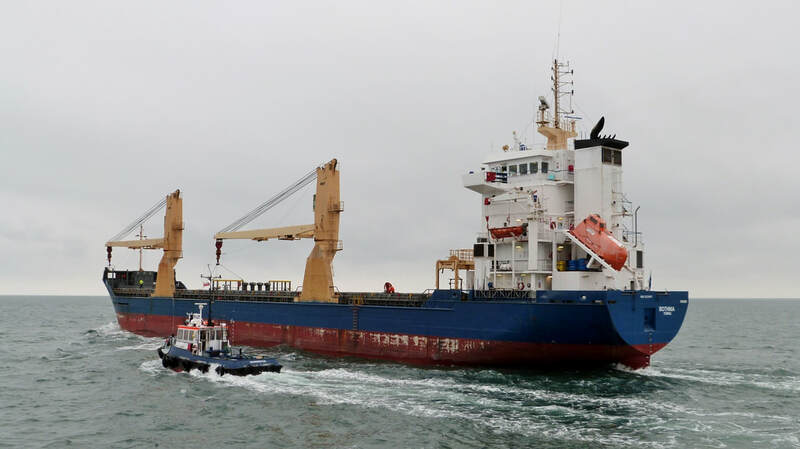 The pilot waited for maximum water depth before bringing the fully laden vessel into port as there was still a heavy swell at the port's entrance. 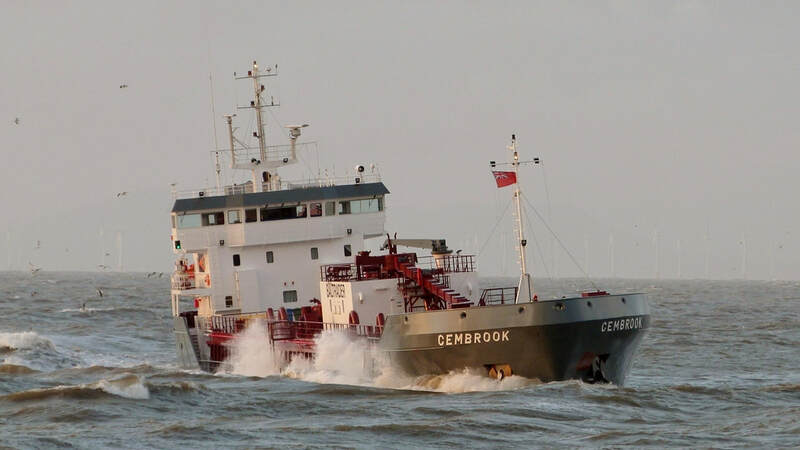 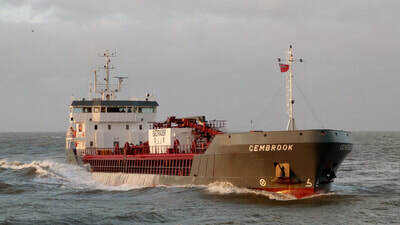 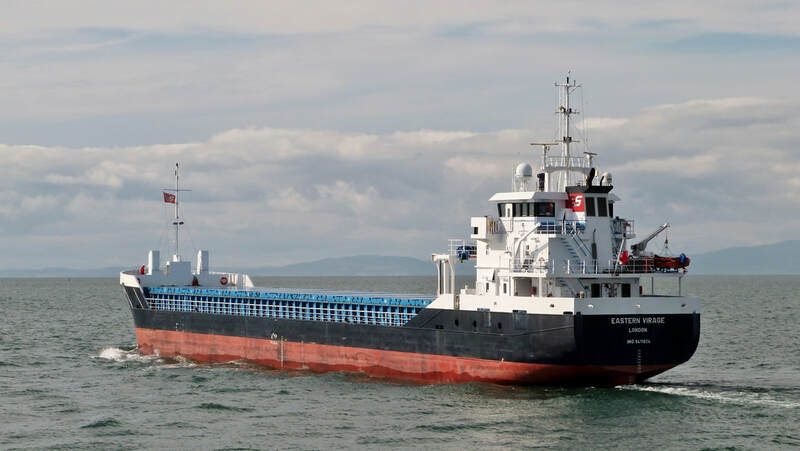 CEMBROOK is the newest addition to 'Baltrader's' fleet of 10 self-discharging vessels. At 100m length & 4,550ton DWT she is second in size to CEMISLE, another regular visitor. This is her third visit to Workington. ​There was a good turnout of photographers to capture some dramatic shots of the approach which was handled with precision by pilot & crew. 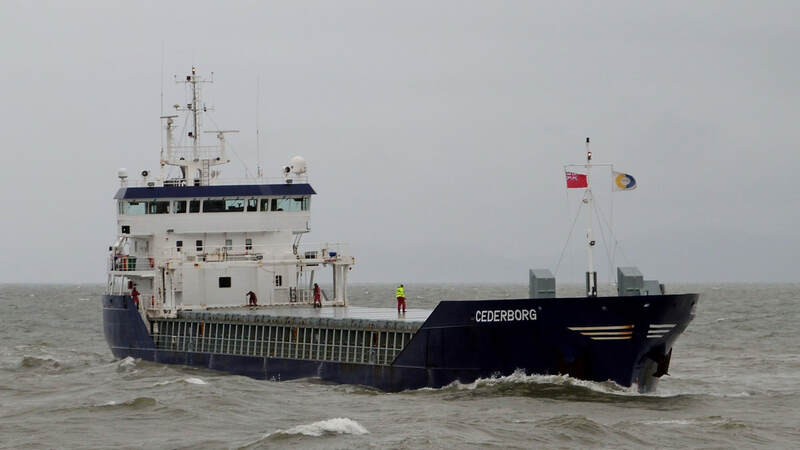 Outbound on a grey morning for Varberg, Sweden. 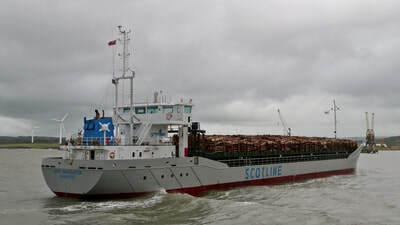 ​This was the fifth visit of 'Scotline's' ex-ODERTAL, on this occasion with baled wood pulp from Vlissingen. Built in 2007, the 90m, 4,500ton DWT general cargo vessel was acquired by 'Scotline' in 2016.